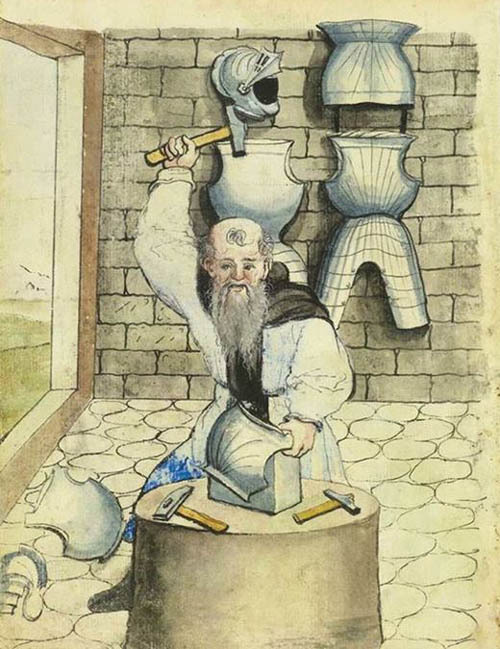 Early plate in Italy, and elsewhere in the 13th15th century were made of iron. 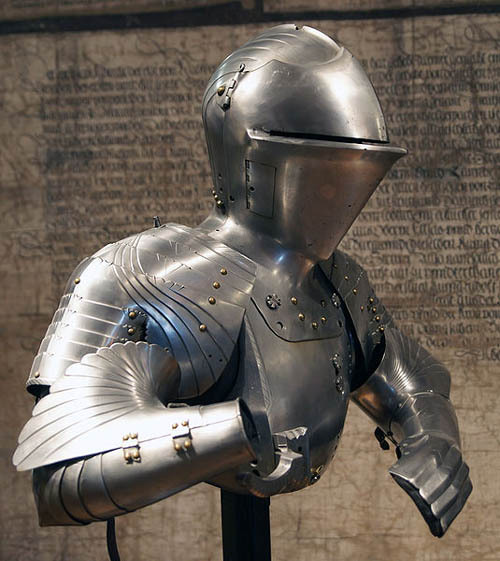 Iron armour could be carburised or case hardened to give a surface of harder steel. 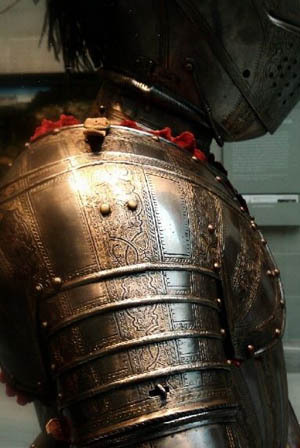 Plate armour became cheaper than mail by the 15th century as it required less labour and labour had become much more expensive after the Black Death, though it did require larger furnaces to produce larger blooms. Mail continued to be used to protect those joints which could not be adequately protected by plate, such as the armpit, crook of the elbow and groin. Another advantage of plate was that a lance rest could be fitted to the breast plate. 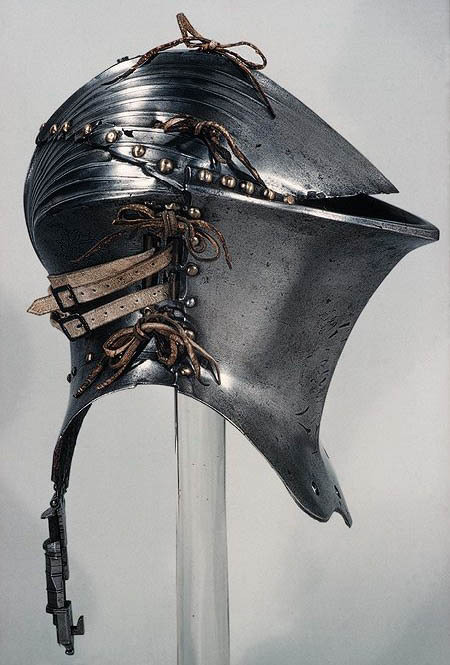 The small skull cap evolved into a bigger true helmet, the bascinet, as it was lengthened downward to protect the back of the neck and the sides of the head. 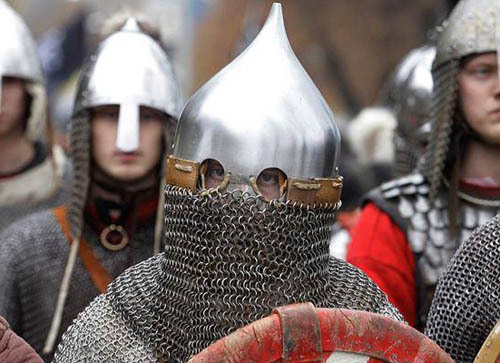 Additionally, several new forms of fully enclosed helmets were introduced in the late 1300s. 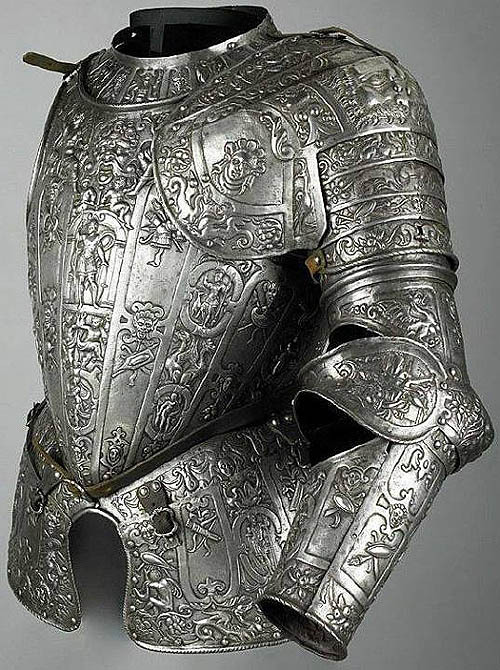 Probably the most recognised style of armour in the World became the plate armour associated with the knights of the European Late Middle Ages, but continuing to the early 17th century Age of Enlightenment in all European countries. 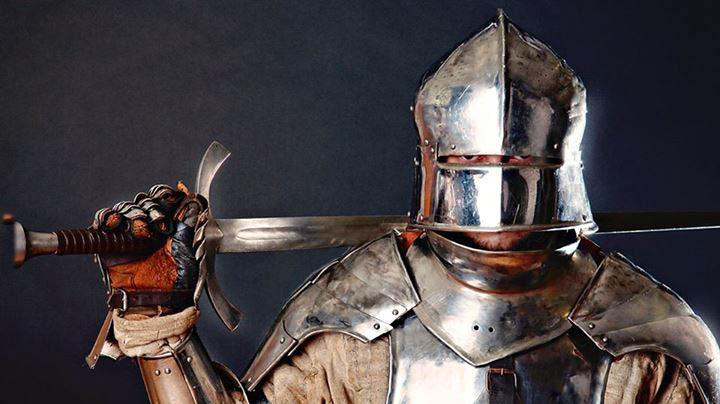 By about 1400 the full harness of plate armour had been developed in armouries of Lombardy. Heavy cavalry dominated the battlefield for centuries in part because of their armour. 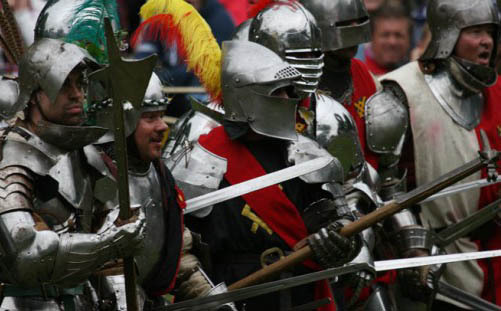 In the early 15th century, advances in weaponry allowed infantry to defeat armoured knights on the battlefield. The quality of the metal used in armour deteriorated as armies became bigger and armour was made thicker, necessitating breeding of larger cavalry horses. 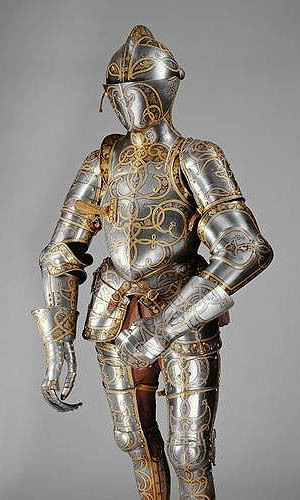 If during the 1415th centuries armour seldom weighed more than 15kgs, than by the late 16th century it weighed 25 kg. 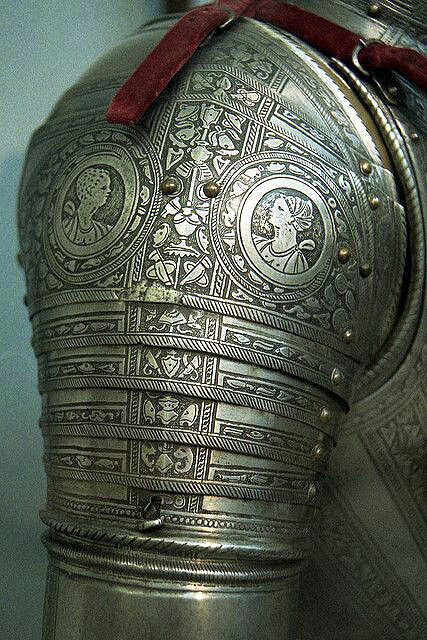 The increasing weight and thickness of late 16th century armour therefore gave substantial resistance. In the early years of low velocity firearms, full suits of armour, or breast plates stopped bullets fired from a modest distance. Crossbow bolts would seldom penetrate good plate, nor would any bullet unless fired from close range. In effect, rather than making plate armour obsolete, the use of firearms stimulated the development of plate armour into its later stages. For most of that period, it allowed horsemen to fight while being the targets of defending arquebuseers without being easily killed. Full suits of armour were worn by generals and princely commanders right up to the second decade of the 18th century. It was the only way they could be mounted and survey the overall battlefield with safety from distant musket fire. The horse was afforded protection from lances and infantry weapons by steel plate barding. 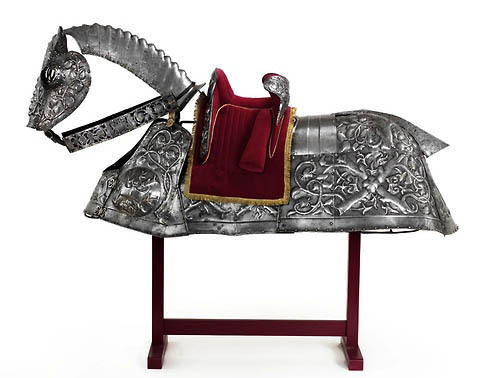 This gave the horse protection and enhanced the visual impression of a mounted knight. Late in the era, elaborate barding was used in parade armour. 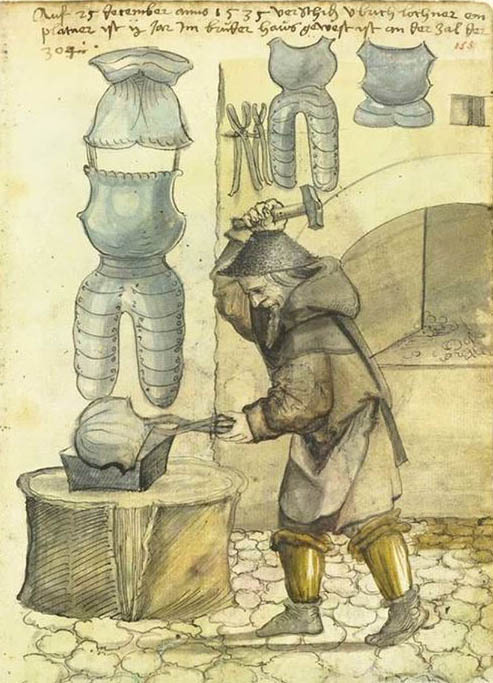 Gradually starting in the mid 16th century, one plate element after another was discarded to save weight for foot soldiers. 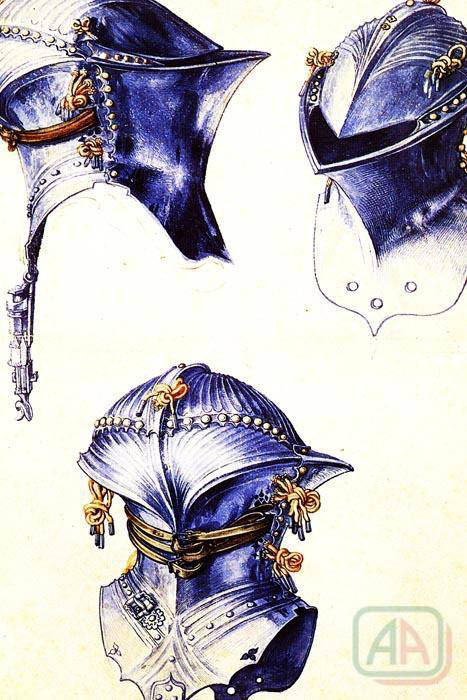 Back and breast plates continued to be used throughout the entire period of the 18th century and through Napoleonic times, in many European (heavy) cavalry units, until the early 20th century. From their introduction, muskets could pierce plate armour, so cavalry had to be far more mindful of the fire. 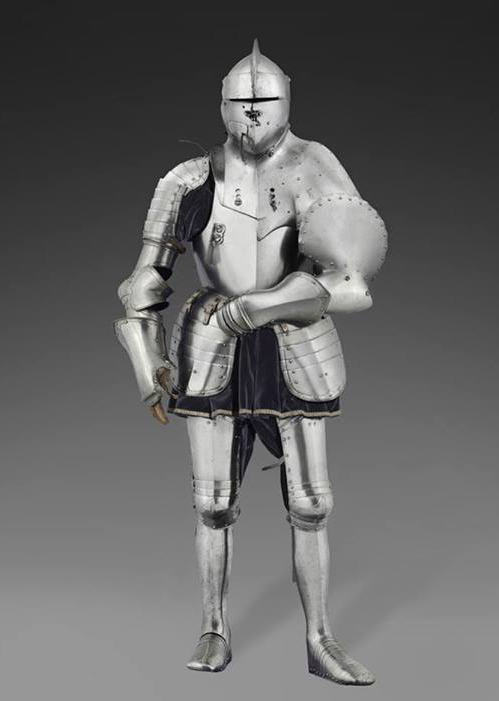 Though the age of the knight was over, armour continued to be used in many capacities. Soldiers in the American Civil War bought iron and steel vests from peddlers (both sides had considered but rejected body armour for standard issue). The effectiveness of the vests varied widely- some successfully deflected bullets and saved lives but others were poorly made and resulted in tragedy for the soldiers. In any case the vests were abandoned by many soldiers due to their weight on long marches as well as the stigma they got for being cowards from their fellow troops. At the start of World War I, thousands of the French Cuirassiers rode out to engage the German Cavalry who likewise used helmets and armour. The word chainmail is of relatively recent coinage, having been in use only since the 1700s; prior to this it was referred to simply as mail. 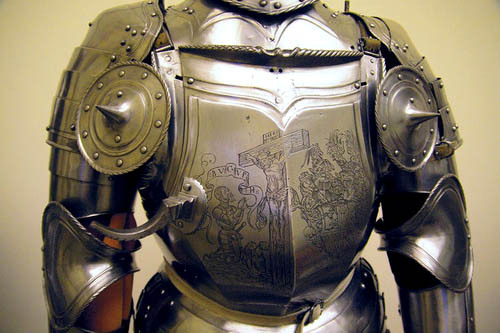 The word itself refers to the armour material, not the garment made from it. 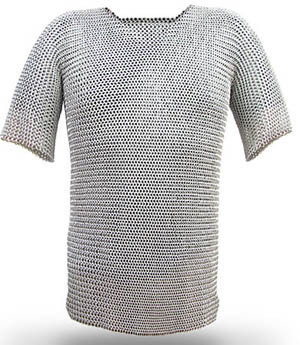 A shirt made from mail is a hauberk if knee-length, haubergeon if mid-thigh length, and byrnie if waist-length. Mail leggings are called chausses, mail hoods coif and mail mittens mitons. 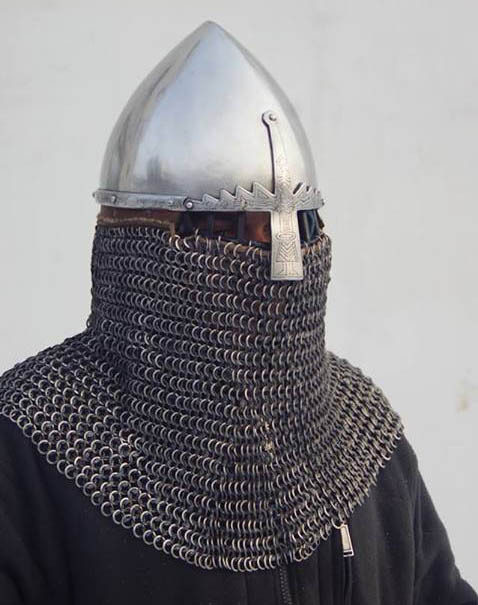 A mail collar hanging from a helmet is camail or aventail. A mail collar worn strapped around the neck was called a pixane or standard. 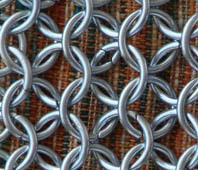 In the Dark Ages chain mail was often referred to as "ring maille" to distinguish it from other types of mail, such as lamellar and splinted mail. 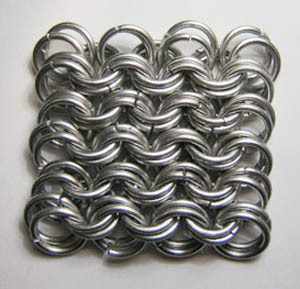 In the Middle Ages scale mail died out, but chain mail remained, and people called it "maille" or "mayle." 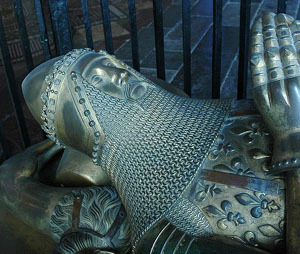 As with heraldry, the language of armour is French, and chain mail is no exception. 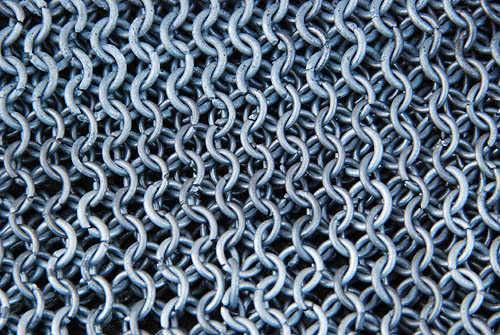 The word maille comes from the French, meaning mesh or net. The use of mail was prominent throughout the Dark Ages, High Middle Ages and Renaissance, and reached its apex in Europe, in terms of coverage, during the 13th century, when mail covered the whole body. 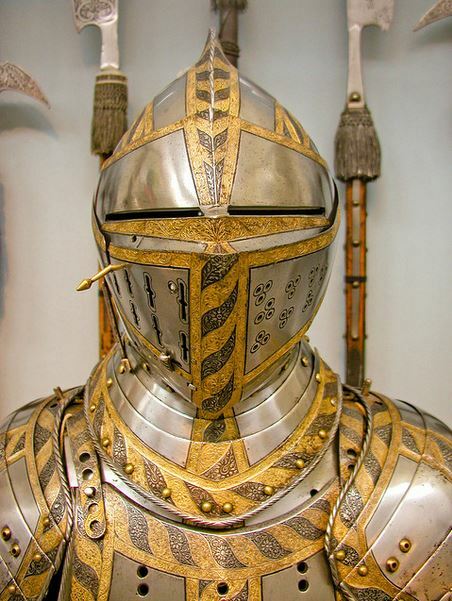 By the 14th century, plate armour was commonly used to supplement mail. Eventually mail was supplanted by plate for the most part. However, mail was still widely used by many soldiers as well as brigandines and padded jacks. 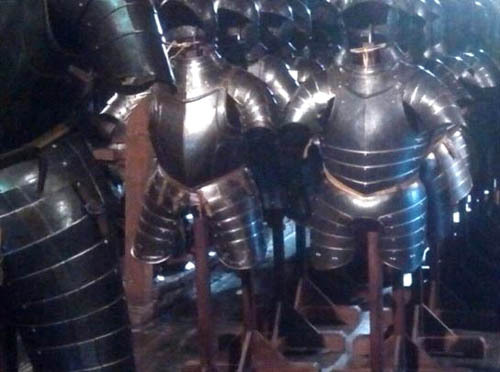 These three types of armour made up the bulk of the equipment used by soldiers with mail being the most expensive. 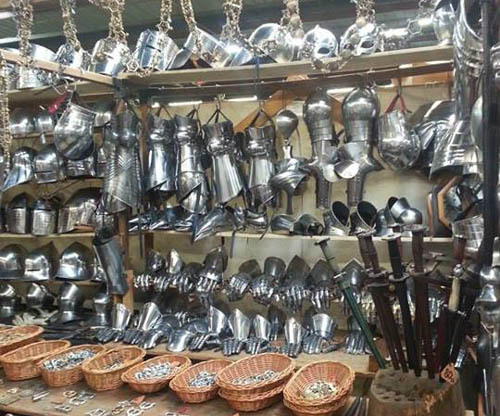 It was quite often more expensive than plate armour. A mail shirt interwoven between two layers of fabric is called jazzeraint, and can be worn as protective clothing. Mail construction is mentioned in the Quran as knowledge that God gave to David. 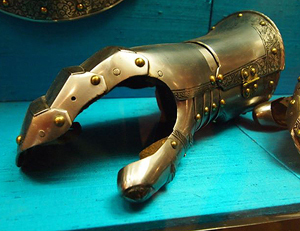 Mail armour provided an effective defence against slashing blows by an edged weapon and penetration by thrusting and piercing weapons; in fact The Royal Armoury at Leeds concluded that "... it is almost impossible to penetrate using any conventional medieval weapon..." Generally speaking, mail's resistance to weapons is determined by four factors: linkage type (riveted, butted, or welded), material used (iron versus bronze or steel), Weave density (a tighter weave needs a thinner weapon to surpass), and ring thickness (generally ranging from 16 to 12 gauge in most examples). Mail, if a warrior could afford it, could provide a significant advantage to him when combined with competent fighting techniques. 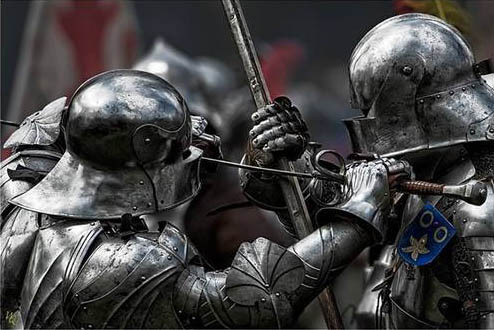 However, a good sword blow arriving in exactly perpendicular angle to surface could cut through the links; when the mail was not riveted, a well placed thrust from a spear or thin sword could penetrate, and a poleaxe or halberd blow could break through the armour. Special arrows, known as bodkins, were later made that were able to penetrate light mail through the loops of the chain. 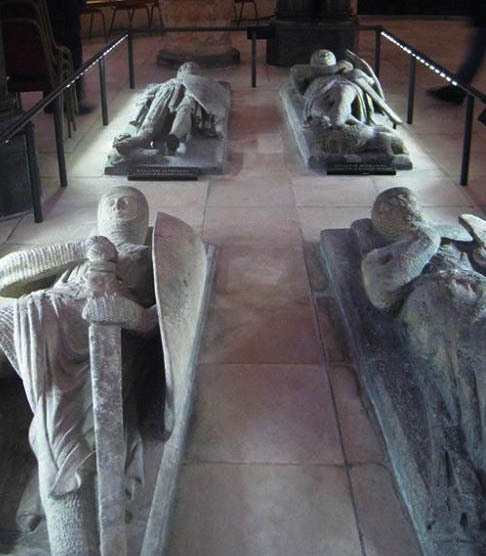 Some evidence indicates that during armoured combat the intention was to actually get around the armour rather than through it—according to a study of skeletons found in Visby, Sweden, a majority of the skeletons showed wounds on less well protected legs. The flexibility of mail meant that a blow would often injure the wearer, potentially causing serious bruising or fractures, and it was a poor defence against head trauma. 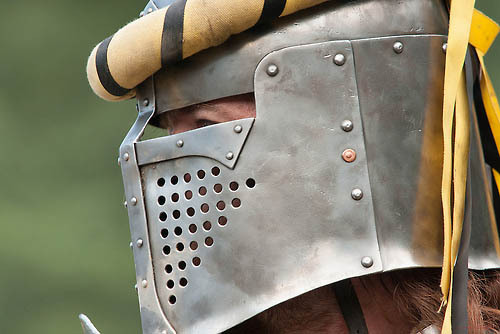 Mail-clad warriors typically wore separate rigid, helms over their mail coifs for head protection. 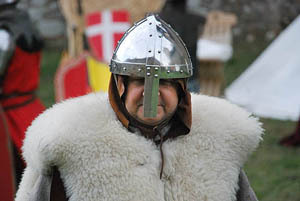 Likewise, blunt weapons such as maces and warhammers could harm the wearer by their impact without penetrating the armour; usually a soft armour, such as gambeson, was worn under the hauberk. Mail, however, had importance in that it reduced the risk of cuts and infection that could often be life threatening to a soldier. Several patterns of linking the rings together have been known since ancient times, with the most common being the 4-to-1 pattern (where each ring is linked with four others). In Europe, the 4-to-1 pattern was completely dominant. Historically, in Europe, from the pre-Roman period on, the rings composing a piece of mail would be riveted closed to reduce the chance of the rings splitting open when subjected to a thrusting attack or a hit by an arrow. Up until the 14th century European mail was made of alternating rows of both riveted rings and solid rings. After that it was almost all made from riveted rings only. Both would have been made using wrought iron. Some later pieces were made of wrought steel with an appreciable carbon content that allowed the piece to be heat treated. Wire for the riveted rings was formed by either of two methods. One was to hammer out wrought iron into plates and cut or slit the plates. These thin pieces were then pulled through a draw-plate repeatedly until the desired diameter was achieved. Waterwheel powered drawing mills are pictured in several period manuscripts. Another method was to simply forge down an iron billet into a rod and then proceed to draw it out into wire. The solid links would have been made by punching from a sheet. Hauberk or Haubergeon ? 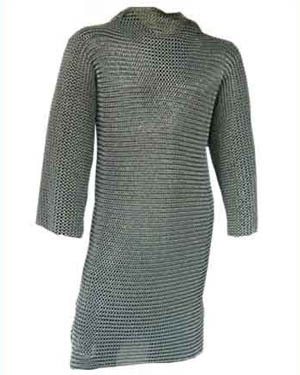 to 14th C.
The hauberk is typically a type of mail armour constructed of loops of metal woven into a tunic or shirt. The sleeves sometimes only went to the elbow, but often were full arm length, with some covering the hands with a supple glove leather face on the palm of the hand, or even full mail gloves. 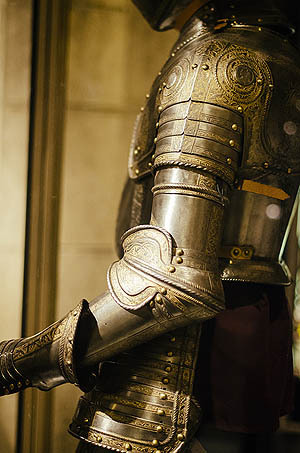 It was usually thigh or knee length, with a split in the front and back to the crotch so the wearer could ride a horse. It sometimes incorporated a hood, or coif. 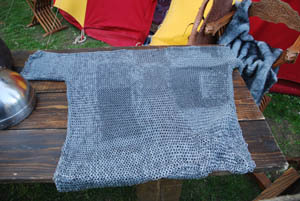 The term Haubergeon ("little hauberk") refers to a shorter variant with partial sleeves, but the terms are often used interchangeably. Slits to accommodate horseback-riding are often incorporated below the waist. Most are put on over the head. 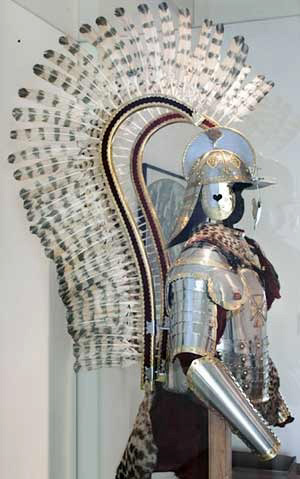 Hauberk can also refer to a similar garment of scale armour. The earliest extant example was found in Ciumeşti in modern Romania and is dated to the 4th-5th centuries BC. Roman armies adopted similar technology after encountering it. Mail armour spread throughout the Mediterranean Basin with the expansion of the Romans. It was quickly adopted by virtually every iron-using culture in the world, with the exception of the Chinese. The Chinese used it rarely, despite being heavily exposed to it from other cultures. The short-hemmed, short-sleeved hauberk may have originated from the medieval Islamic world. The Bayeux Tapestry illustrates Norman soldiers wearing a knee-length version of the hauberk, with three-quarter length sleeves and a split from hem to crotch. 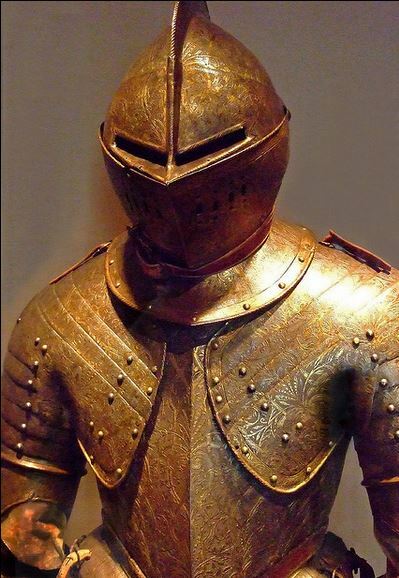 Such armour was expensive — both in materials (iron wire) and time/skill required to manufacture it — so common foot soldiers rarely were so equipped. 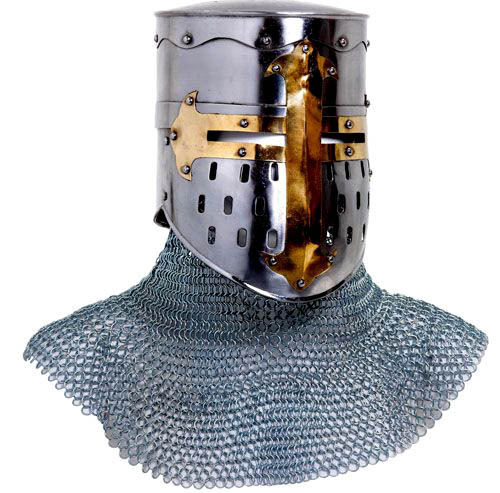 In Europe, use of mail hauberks continued up through the 14th century, when plate armour began to supplant it. A mail collar. It is a circle with a hole for the neck to fit through. It covers the shoulders, breast and upper back. Mail that protects areas not covered by plate. Mail hose, either knee-high or cover the whole leg. Mail is still used as protective clothing by butchers, woodcarvers, police and Scuba divers and as decoration on some military uniforms. A Knight removing his mail hauberk. 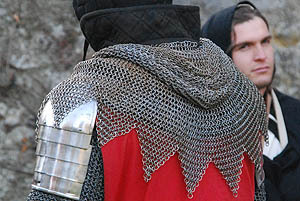 An aventail or camail is a flexible curtain of chainmail that covers the neck and shoulders. Plate armour, which protected the chest and the lower limbs, was used by the ancient Greeks and Romans, but it fell into disuse after the collapse of the Roman Empire because of the cost and work involved in producing a lorica segmentata or comparable plate armour. 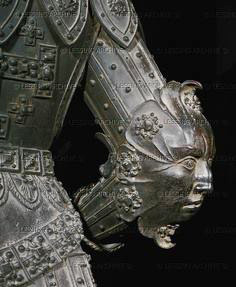 Single plates of metal armour were again used from the late 13th century on, to protect joints and shins, and these were worn over a mail hauberk. 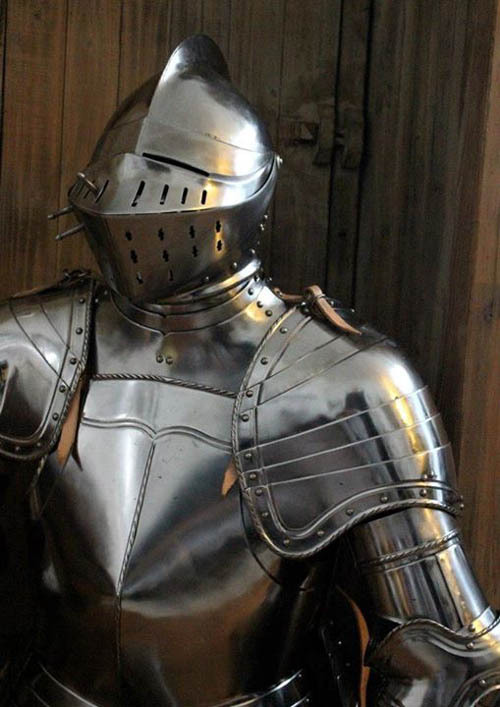 By the end of the 14th century, larger and complete full plates of armour had been developed. 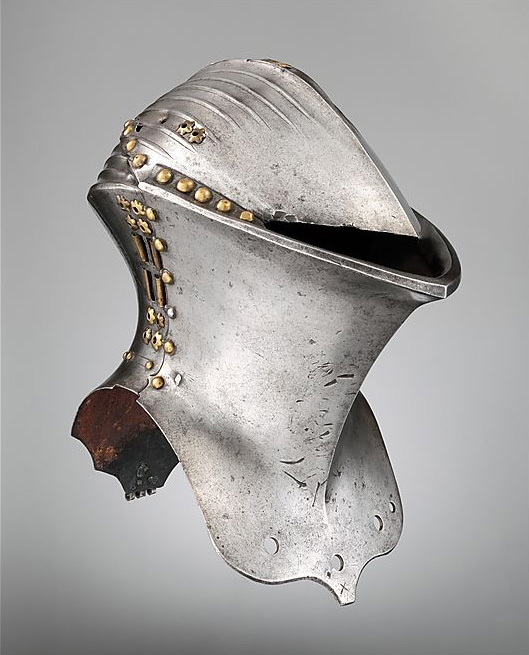 During the early 1500s the helmet and neckguard design was reformed to produce the so-called Nürnberg armour, many of them masterpieces of workmanship and design. 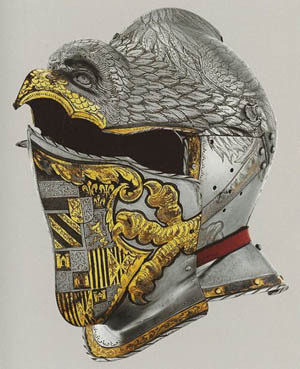 European leaders in armouring techniques were northern Italians and southern Germans. This led to the styles of Milanese from Milan, and Gothic from the Holy Roman Empire. England produced armour in Greenwich and they both developed their own unique style. 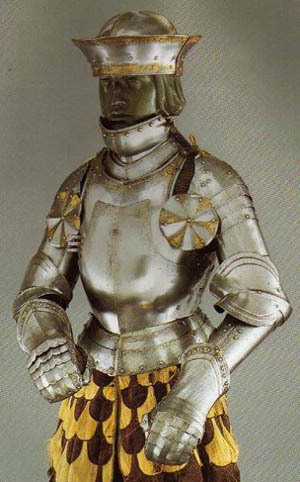 Maximilian style armour immediately followed this, in the early 16th century. 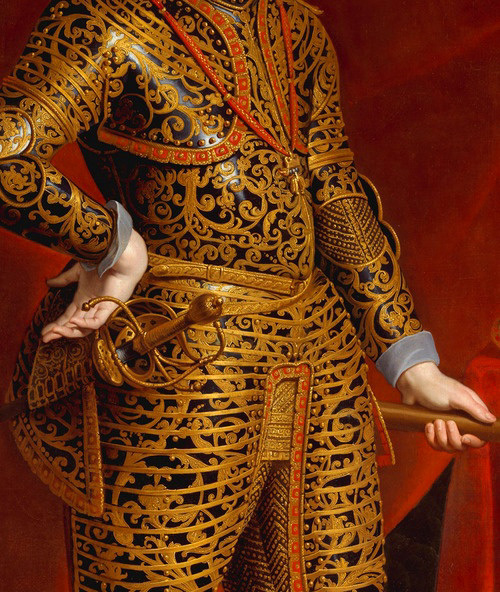 Full plate armour was expensive to produce and remained therefore restricted to the upper strata of society; lavishly decorated suits of armour remained the fashion with 18th century nobles and generals long after they had ceased to be militarily useful on the battlefield due to the advent of powerful muskets. 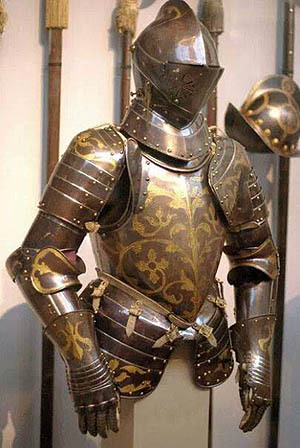 Reduced plate armour, typically consisting of a breastplate, a burgonet, morion or cabasset and gauntlets, however, also became popular among 16th century mercenaries and there are many references to so-called munition armour being ordered for infantrymen at a fraction of the cost of full plate armour. 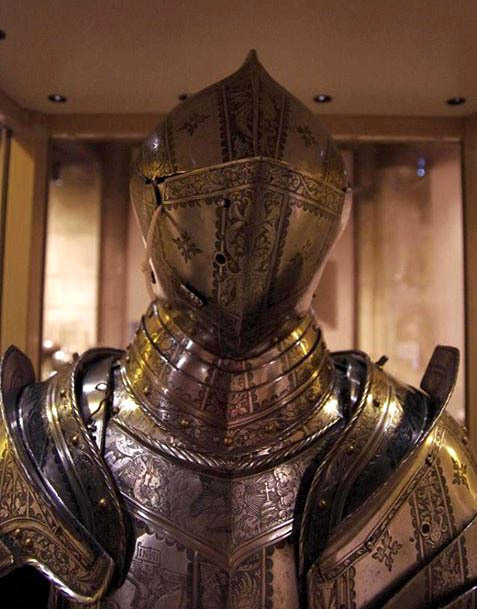 This mass-produced armour was often heavier and made of lower quality metal than knight armour. From the 15th century on, armour specifically designed for jousting (rather than for battle) and parade armour also became popular. Many of the latter were decorated with biblical or mythological motifs. 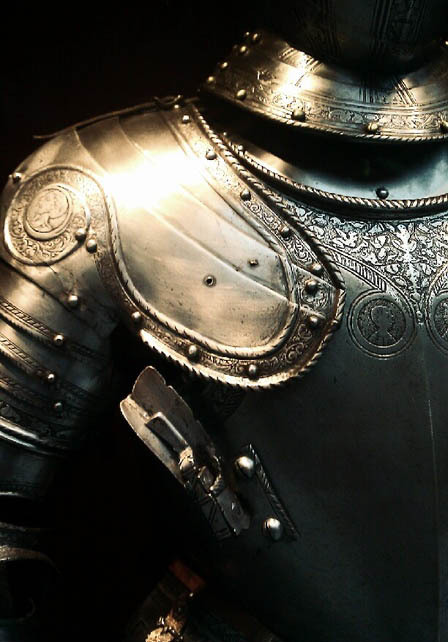 Armour was not confined to the Middle Ages, and in fact was widely used by most armies until the end of the 17th century for both foot and mounted troops. It was only the development of powerful rifled firearms which made all but the finest and heaviest armour obsolete. The increasing power and availability of firearms and the nature of large, state-supported infantry led to more portions of plate armour being cast off in favour of cheaper, more mobile troops. Leg protection was the first part to go, replaced by tall leather boots. By the early part of the 18th century, only field marshals, commanders and royalty remained in full armour on the battlefield as they were tempting targets for musket fire. 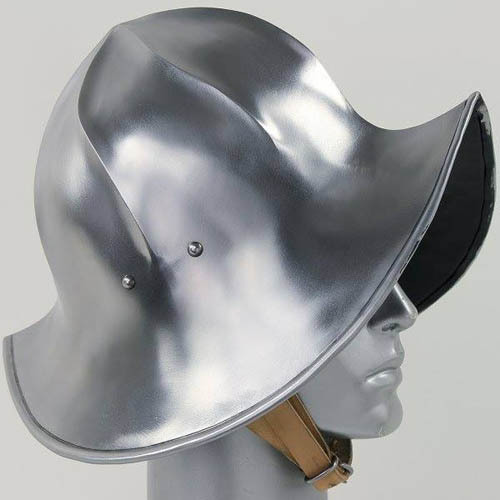 Cavalry units, especially cuirassiers, continued to use front and back plates that could protect them from distanced fire and either helmets or "secrets", a steel protection they wore under a floppy hat. Other armour was hidden under decorative uniforms. The cavalry armour of Napoleon, and the French, German, and British empires (heavy cavalry known as cuirassiers) were actively used through the 19th century right up to the first year of World War I, when French cuirassiers went to meet the enemy in armour outside of Paris. 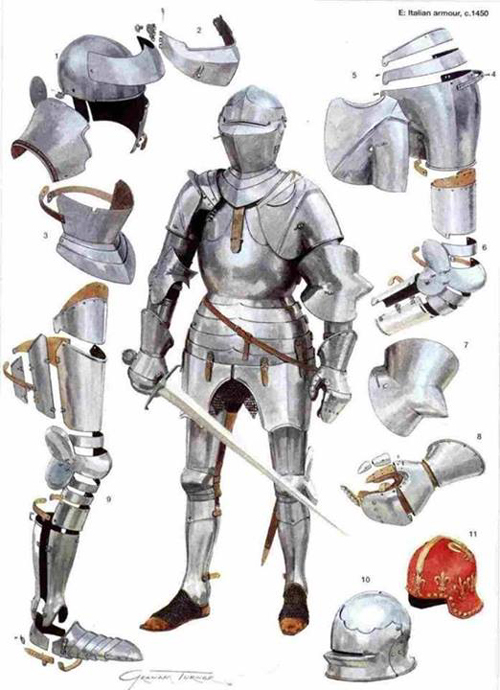 Plate armour could have consisted of a helmet, a gorget (or bevor), pauldrons (or spaulders), couters, vambraces, gauntlets, a cuirass (back and breastplate) with a fauld, tassets and a culet, a mail skirt, cuisses, poleyns, greaves, and sabatons. 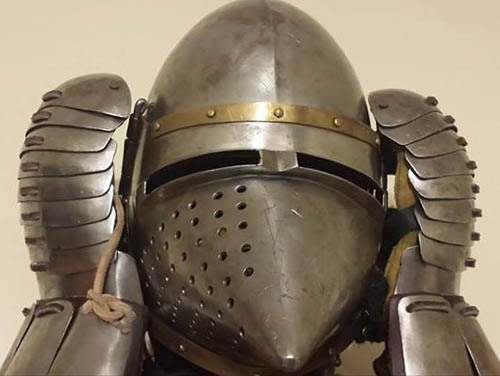 While it looks heavy, a full plate armour set could be as light as only 20 kg (45 pounds) if well made of tempered steel. This is less than the weight of modern combat gear of an infantry soldier (usually 25 to 35 kg), and the weight is more evenly distributed. The weight was so well spread over the body that a fit man could run, or jump into his saddle. Modern re-enactment activity has proven it is even possible to swim in armour, though it is difficult. It is possible for a fit and trained man in armour to run after and catch an unarmoured archer, as witnessed in re-enactment combat. The notion that it was necessary to lift a fully armed knight onto his horse with the help of pulleys is a myth originating in Victorian times. Even knights in heavy jousting armour were not winched onto their horses. 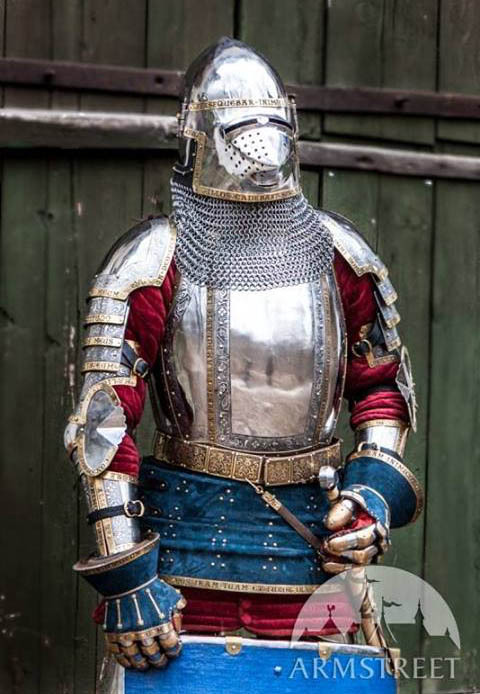 This type of "sporting" armour was meant only for ceremonial lancing matches and its design was deliberately made extremely thick to protect the wearer from severe accidents, such as the one which caused the death of King Henry II of France. 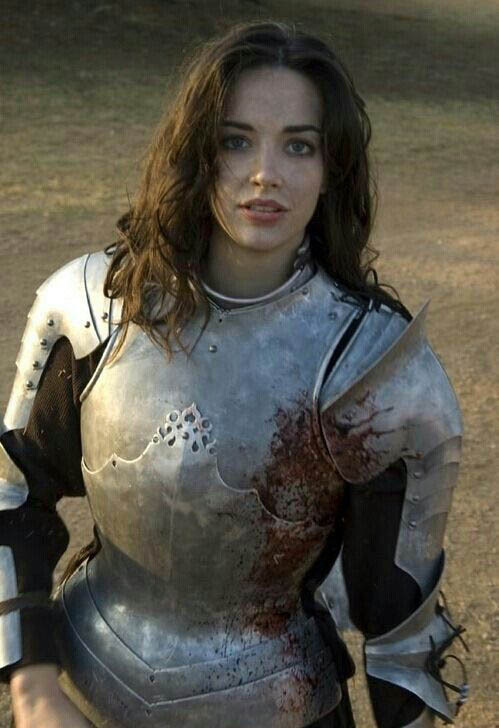 Tournament armour is always heavier, clumsier and more protective than combat armour. Combat armour is a compromise between protection and mobility, while tournament armour stresses protection on cost of mobility. 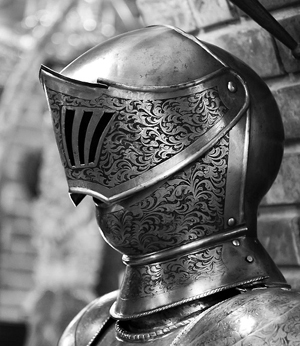 Plate armour was virtually sword-proof. 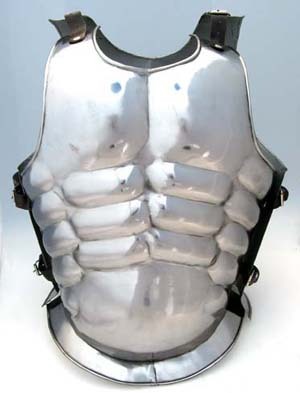 It also protects the wearer well against spear or pike thrusts and provides decent defence against blunt trauma. 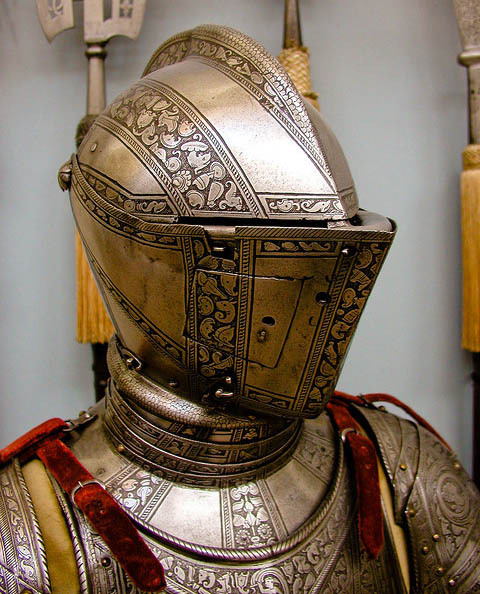 The evolution of plate armour also triggered developments in the design of offensive weapons. While this armour was effective against cuts or blows, their weak points could be exploited by long tapered swords or other weapons designed for the purpose, such as poleaxes and halberds. The effect of arrows and bolts is still a point of contention in regards to plate armour. Some argue that longbows and/or crossbows could regularly pierce plate armour and some contend that they could do so only rarely. Fluted plate was not only decorations, but also reinforced the plate against bending under slashing or blunt impact. This offsets against the fact that flutes could sometimes catch piercing blows. 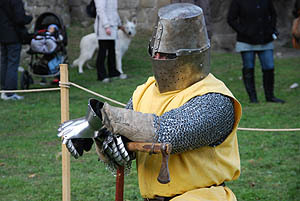 In armoured techniques taught in the German school of swordsmanship, the attacker concentrates on these "weak spots", resulting in a fighting style very different from unarmored sword-fighting. Because of this weakness most warriors wore a mail shirt (haubergeon or hauberk) beneath their plate armour (or coat-of-plates). Later, full mail shirts were replaced with mail patches, called goussets, sewn onto a gambeson or arming jacket. 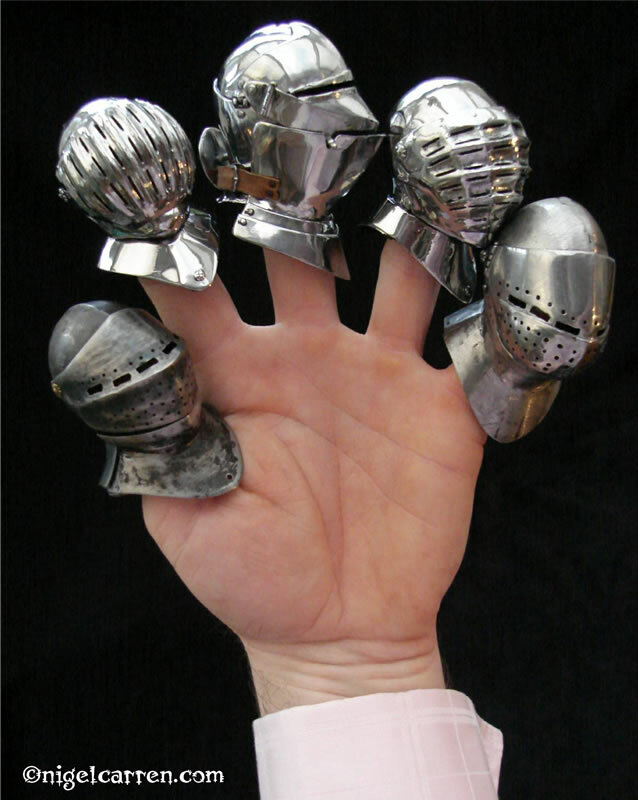 Further protection for plate armour was the use of small round plates called besagews that covered the armpit area and couters and poleyns with "wings" to protect the inside of the joint. 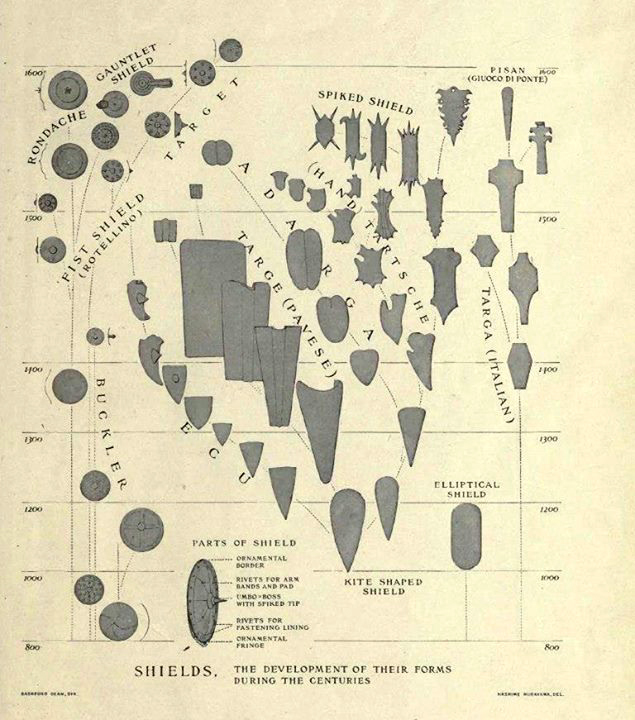 The evolution of the 14th century plate armour also triggered the development of various polearms. They were designed to deliver a strong impact and concentrate energy on a small area and cause damage through the plate. Maces, war hammers and the hammer-heads of pollaxes (poleaxes) were used to inflict blunt trauma through armour. 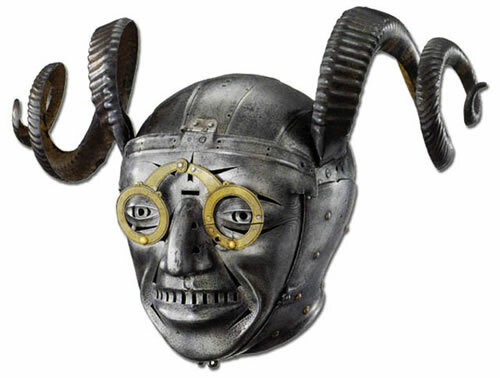 Tournament Helm made of steel, possibly English, c 1500, for tournaments fought on foot. Tournament Helm, steel, possibly English, c 1500, This helm was made for tournaments fought on foot. It hung above the tomb of Sir Giles Capel (1485 - 1556) in Rayne Church, Essex. Sir Giles was part of Henry VIII's retinue at the Field of The Cloth of Gold in 1520. 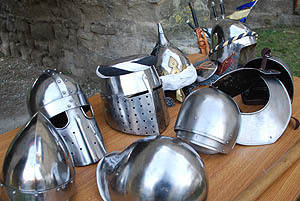 Helmets, or helms, are one of the best known artefacts from the middle ages. They have never fallen out of use but have evolved not only for military use, but for many other spheres of live where there is a danger of head injury - mines, horse and motor cycle riding, building sites and so on. 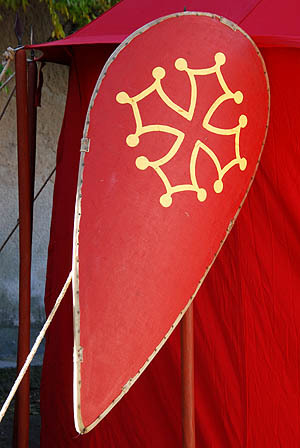 The medieval version - or rather upwards of a dozen medieval versions - are also preserved in coats of arms where they form an essential part of the crest. Indeed crests were originally bird-like crests on the helmet. 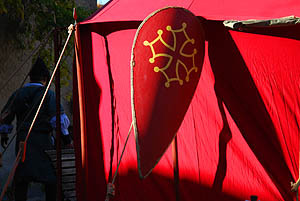 Mantling or lambrequin is drapery tied to the helmet above the shield. It forms a backdrop for the shield. 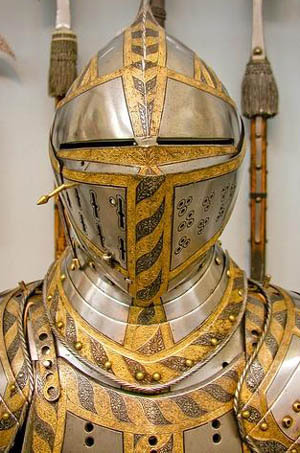 It is a depiction of the protective cloth covering (often of linen) worn by knights from their helmets to stave off the elements, and, secondarily, to decrease the effects of sword-blows against the helmet in battle, from which it is usually shown tattered or cut to shreds as if damaged in combat, though the edges of most are simply decorated at the emblazoner's discretion. The nasal helmet is a type of combat helmet used from the Early Middle Ages until the High Middle Ages. The nasal helmet was a form of helmet with a domed or raised centre, usually formed around a basic skull-cap design, with a single protruding strip that extended down over the nose to provide additional facial protection. 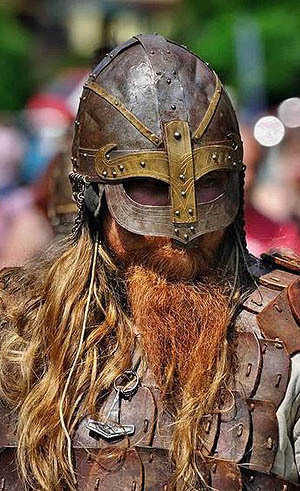 The helmet appeared throughout Europe late in the 9th century, and became the predominant form of head protection, replacing the previous pudding-bowl design, and the Vendel-style spectical helm. 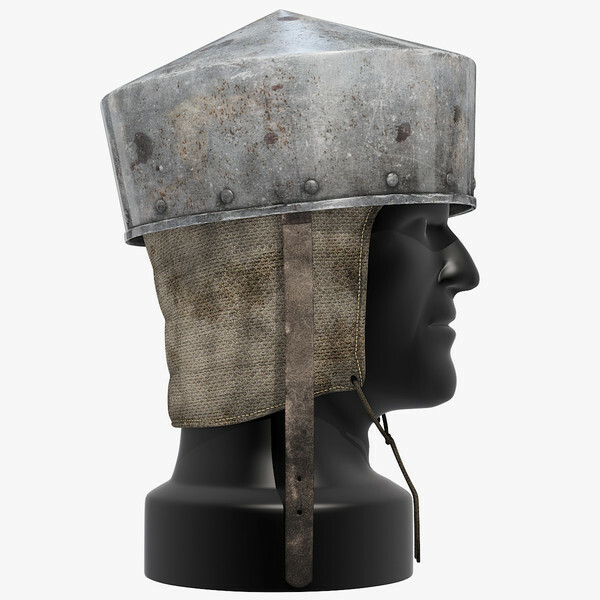 One of the earliest versions of the nasal helm is the Vasgaard Helmet. 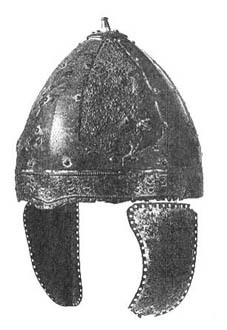 The Bayeux Tapestry features many such helmets, it being the most popular form of protection at the time. 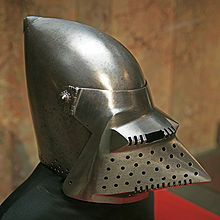 The helmet began to lose popularity at the end of the 12th century to helmets that provided more facial protection, and although the nasal helm lost popularity amongst the higher classes of knights and men-at-arms, they were still seen amongst archers to whom a wide field of vision was crucial. 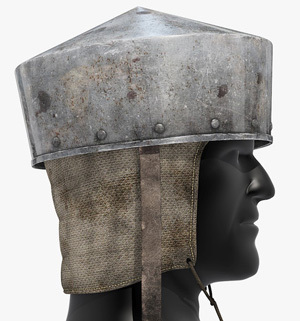 The helmet can also be viewed throughout the Maciejowski Bible as a minority item for cavalrymen, giving the impression that it had become uncommon (though not unknown) by the mid-thirteenth century. 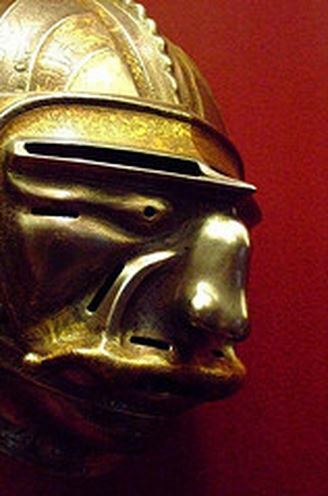 Nasal helmets have been found of both one-piece and Spangenhelm construction, with the later period helmets being made of a single, smooth raised dome to allow weapons to glance off with ease. 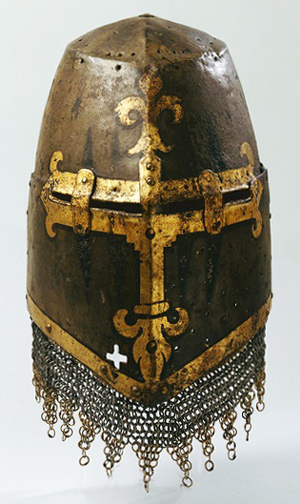 The Spangenhelm was a popular European war combat helmet design of the Early Middle Ages. The name is of German origin. Spangen refers to the metal strips that form the framework for the helmet and could be translated as clips. The strips connect three to six steel or bronze plates. The frame takes a conical design that curves with the shape of the head and culminates in a point. The front of the helmet may include a nose protector (a nasal). 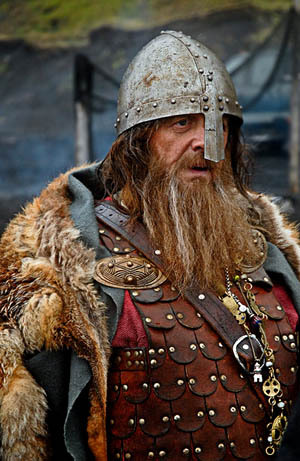 Older spangenhelms often include cheek flaps made from metal or leather. Spangenhelms may incorporate mail as neck protection, thus forming a partial aventail. Some spangenhelms include eye protection in a shape that resembles modern eyeglass frames. Other spangenhelms include a full face mask. 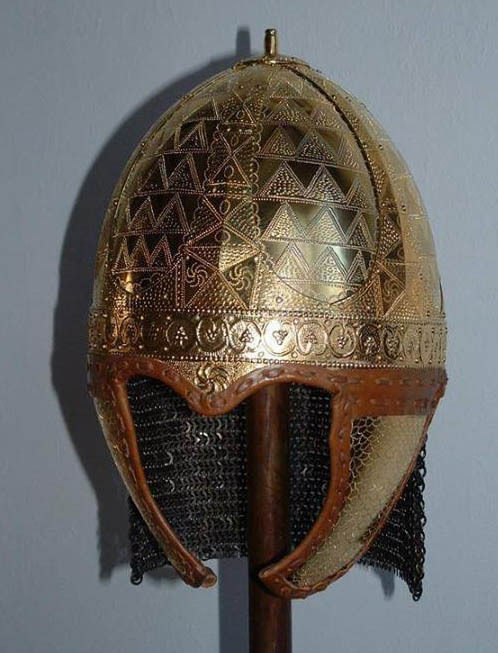 The spangenhelm originated in Central Asia and Ancient Persia, arriving in Europe by way of what is now southern Russia and Ukraine, spread by nomadic Iranian tribes such as the Scythians and Sarmatians who lived among the the Eursian steppes. 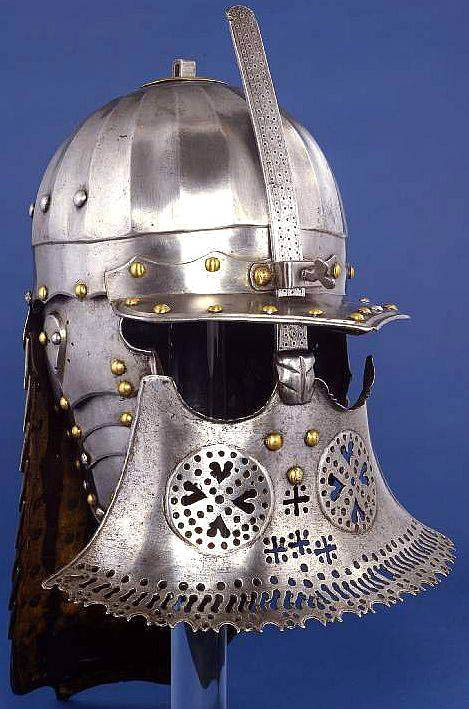 By the 6th century it was the most common helmet design in Europe and in popular use throughout the Middle East. It remained in use at least as late as the 9th century. 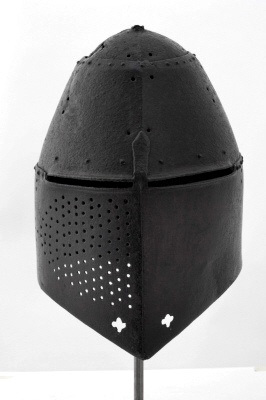 The spangenhelm was an effective protection that was relatively easy to produce. Weakness of the design were its partial head protection and its jointed construction. It was replaced by similarly shaped helmets made with one-piece skulls (nasal helms), kettle hats and eventually the Great helm or casque. 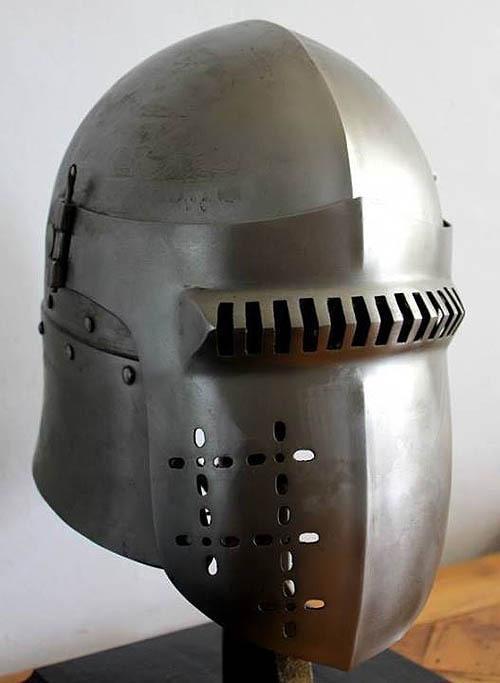 The great helm or heaume, also called pot helm, bucket helm and barrel helm, of the High Middle Ages arose in the late twelfth century in the context of the crusades and remained in use until the fourteenth century. 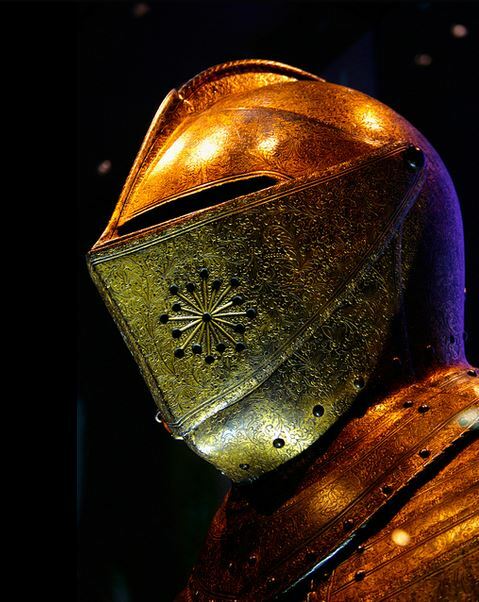 They were used by knights and heavy infantry in most European armies between about 1220 to 1540 AD. In its simplest form, the great helm was a flat-topped cylinder of steel that completely covered the head and had only very small openings for the eyes and mouth. Later designs gained more of a curved design, particularly on the top, to deflect or lessen the impact of blows. 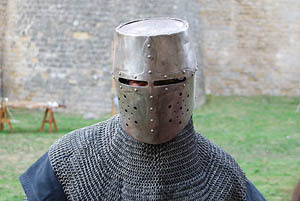 The style is sometimes referred to as a 'crusader helmet', but also as a 'pot helm', and a later variant with a more conical top is known as a 'sugarloaf helm'. In Spanish they are called yelmo de Zaragoza, referring to Saragossa where they were introduced for the first time in the Iberian peninsula. 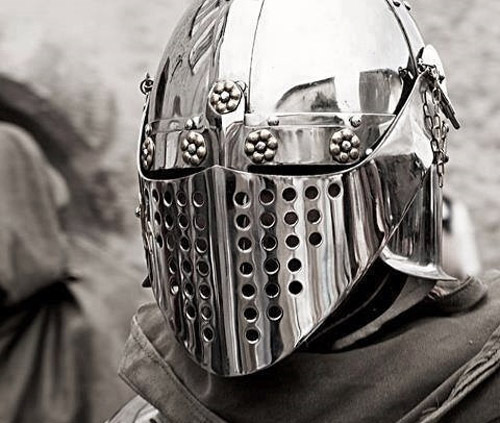 The bascinet evolved from its early skull cap form to supersede the great helm for combat. 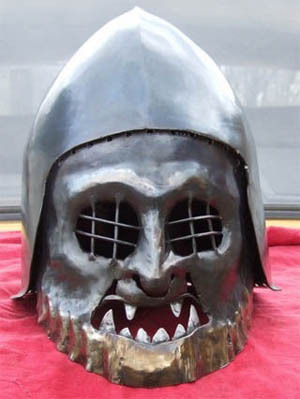 The great helm fell into disuse during the 15th century, however it was used commonly in tournaments where a version of the great helm, the a frog-mouthed tilting helm, evolved. 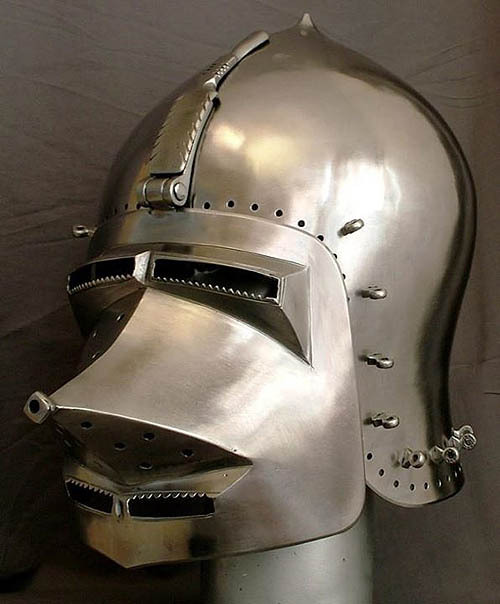 Small "nasals" were developed to protect the nose and part of the face after the great helm was discarded. By the middle of the 14th century, most knights discarded the great helm altogether in favour of a fully visored bascinet. The visor was often conical, giving the appearance of a muzzle or a beak. They were sometimes called "dog faced" (medievally known as a hounskull) or "pig faced" (a common modern term). 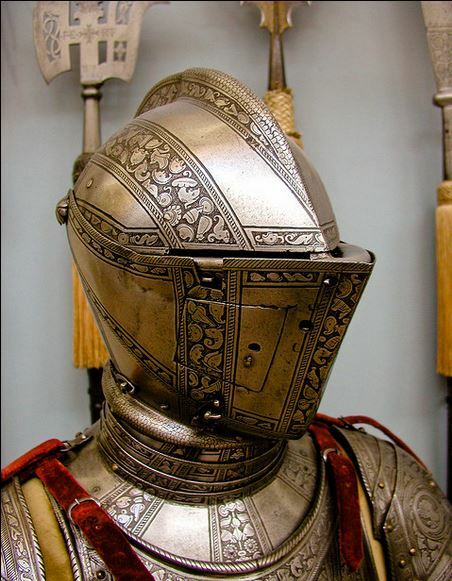 The early versions sometimes had a neck defence of mail called a camail or aventail, while later versions (at the end of the 14th century) often protected the neck with a separate but attached plate assembly, the gorget. The aventail was attached to a leather band, which was in turn attached to the lower border of the bascinet by a series of staples called vervelles. Holes in the leather band were passed over the vervelles, and a waxed cord was passed through the holes in the vervelles to secure it. The helmet also had a series of small holes around the bottom edge of the helmet and the face hole. These holes were used to sew a padded liner inside the helmet. The liner was made of linen or a linen blend cloth stuffed with wool or horsehair. The top of the liner was a series of lobes which were gathered by a cord to adjust how high the helmet rode on the wearer's head. 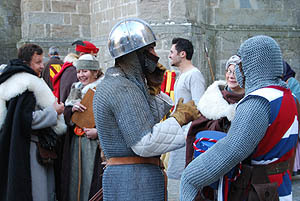 While no known chin straps were used, the bascinet was often prevented from being lifted off the wearer's head by tying or strapping the camail to the surcoat or armour. 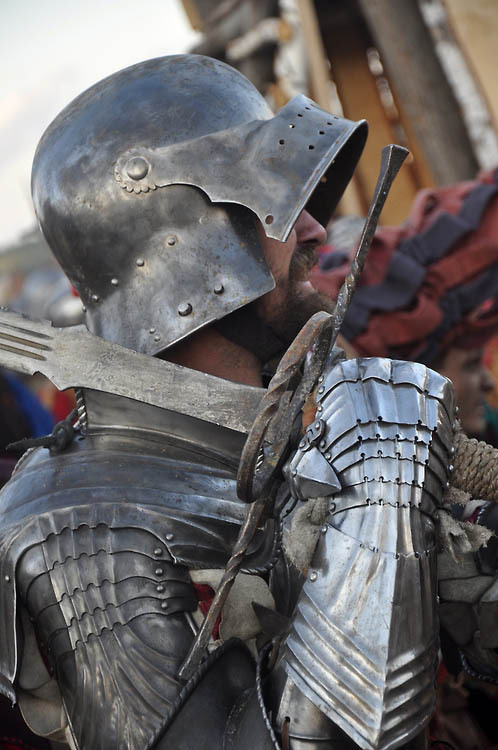 Over the course of the late 1300s to early 1400s, the bascinet evolved from a shorter form with a shorter point (or no point at all) to its more pointed formsome so severe as to have a vertical back. In Germany a more bulbous version also appeared in the beginning of the 15th century. During the first half of the 15th century, more plates were added to protect the throat better, producing a form called the "great bascinet". 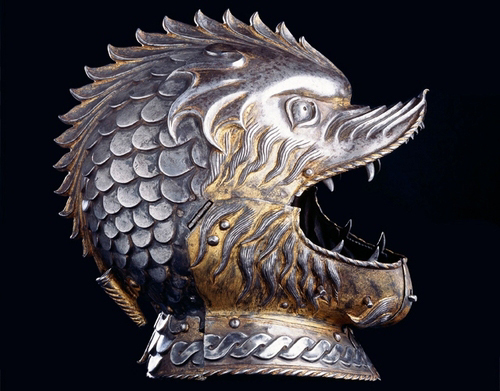 Both the portion covering the skull and the hinged visor over the face became less angular and more rounded, until by the mid- to late 1400s, the great bascinet had evolved into the armet. Two styles of attaching the visor existed. The "klappvisor" was a single hinge at the front of the forehead that was commonly seen in Germany. The side-pivot mount used two pivots on the side of the helmet, which connected to the visor with hinges to compensate for the lack of parallelism in the pivots. The side-pivot system was commonly seen in Italian armours. 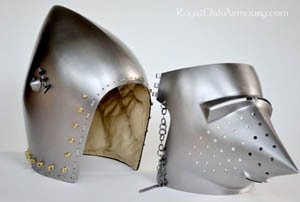 Some seasoned knights often wore their bascinets without visors for better visibility and breathing during hand-to-hand combat, and to avoid heat exhaustion. 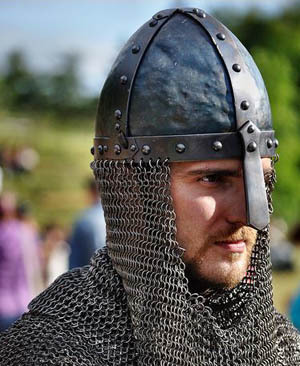 An aventail or camail is a flexible curtain of chainmail on a helmet, that extends to cover the neck and shoulders. The mail could be attached to the helm by threading a leather cord through brass rings at the edge of the helm. 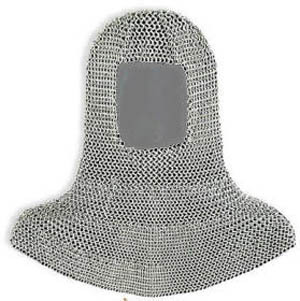 Aventails were most commonly seen on bascinets in the 14th century and served as a replacement for a chainmail coif. Some aventails were decorated with edging in brass or bronze links, or dagged edges. 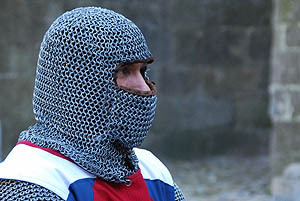 By the late 15th century, the Aventail had replaced the chainmail coif completely. Only those who were poor or who were collectors of the sort had a chainmail coif. 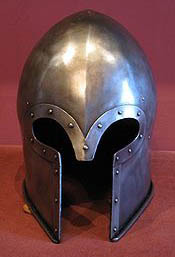 Aventails were typically attached to the helmet via small staples known as vervelles. 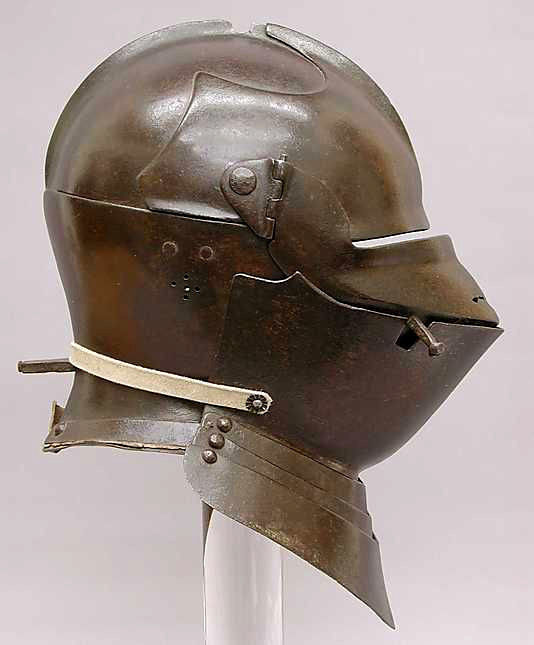 15th C. A bowl helmet that encloses the entire head with the use of hinged cheek plates that fold backwards. A gorget was attached and a comb may be present. It may also have a rondel at the rear. 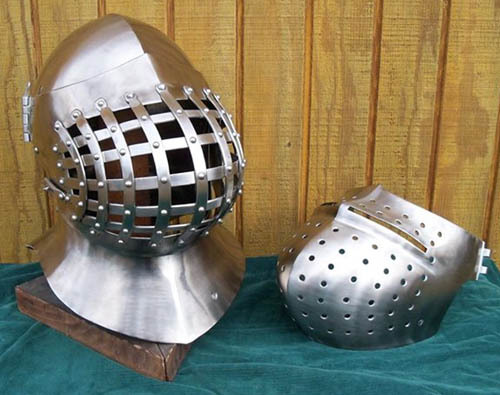 Later armets have a visor. 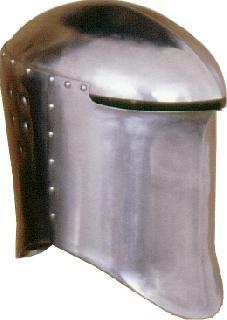 A stereotypical knight's helm especially favoured in Italy. 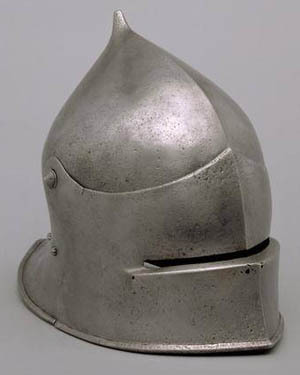 The sallet (also called salade and schaller) was a war helmet that replaced the bascinet in northern Europe and Hungary during the mid-15th century. 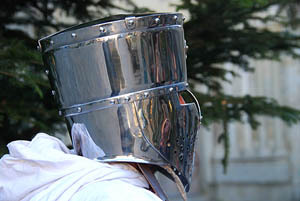 Some sallets were close fitting except at the back of the head where they extended and formed a pointed tail. Some Italian ones followed the shape of the neck, and had an additional plate riveted on. 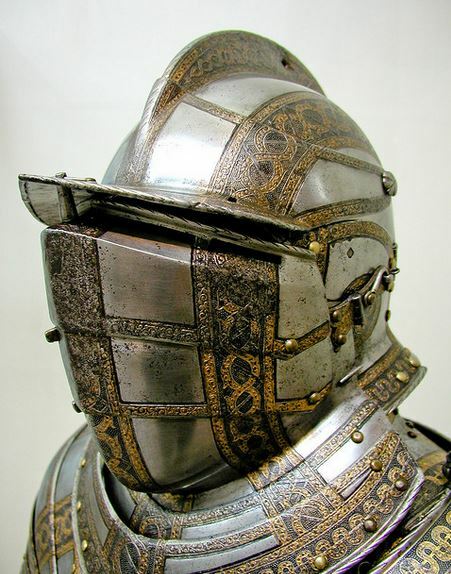 Many sallets were worn with an extended, padded, gorget called a bevor that protected the wearer's jaw. 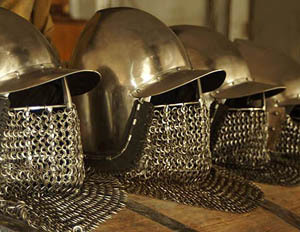 Some sallet versions have occularia in the form of a slit in a visor, some have this slit in the front of the helm, or even in the brim. Most sallets needed no breathing holes, as there was a natural gap where it overlapped the bevor near the wearer's mouth. 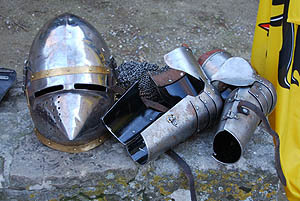 Some Italian sallets had a "bellows visor" with breaths cut into the visor. 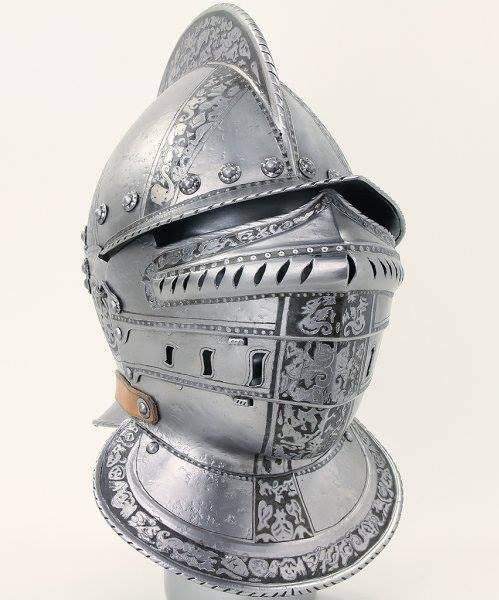 This helmet design contrasted with the barbute which was popular in Italy at the same time. 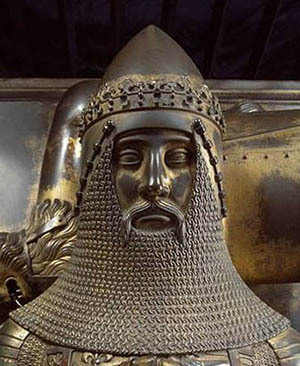 Unlike the sallet, the barbute itself protected the jaw and neck. 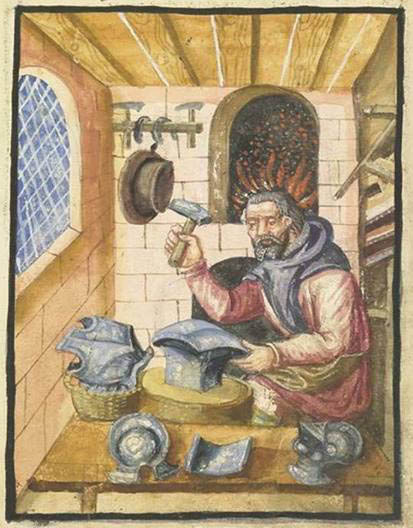 So whereas the gorget or bevor were important counterparts to the sallet, they were usually absent in barbutes. Barbutes did not pivot. Sallets did not share the barbute's resemblance to classical Greek or Roman artefacts. 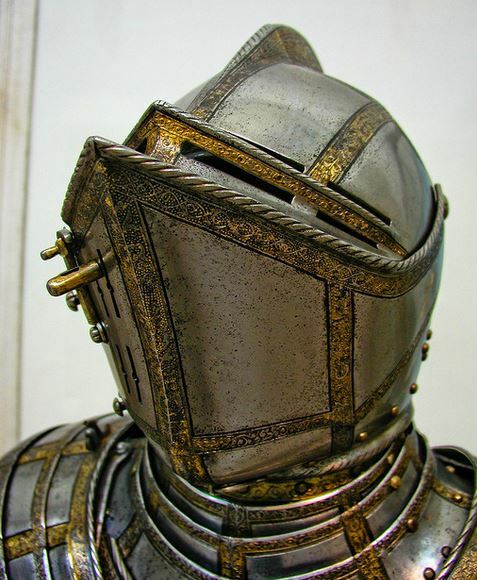 A bevor is a piece of plate armour designed to protect the neck. A bevor can be made of a single solid piece or multiple articulated lamés around the neck and chin. 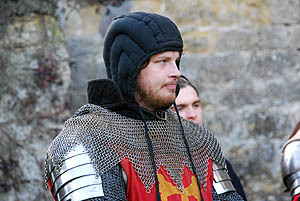 The bevor was typically worn in conjunction with a sallet, and later with a burgonet, in a form known as a falling buffe. 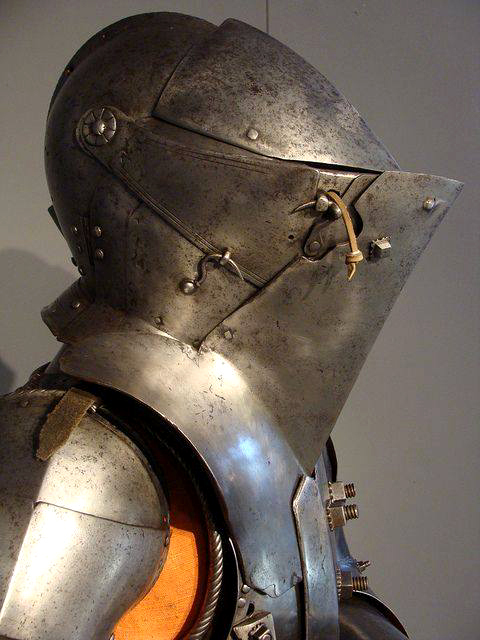 In both cases the two pieces of armour combined to provide protection for the whole of the head and neck. 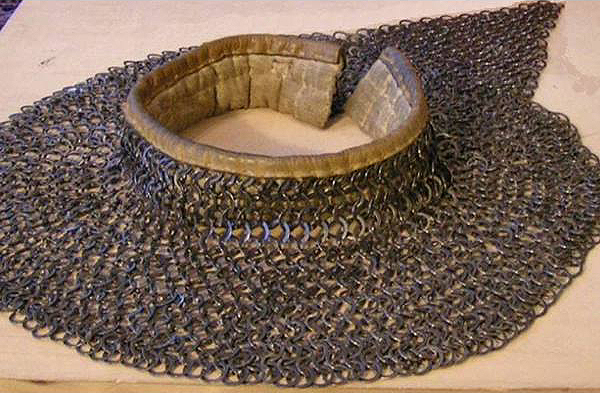 A gorget was a steel or leather collar also designed to protect the throat. 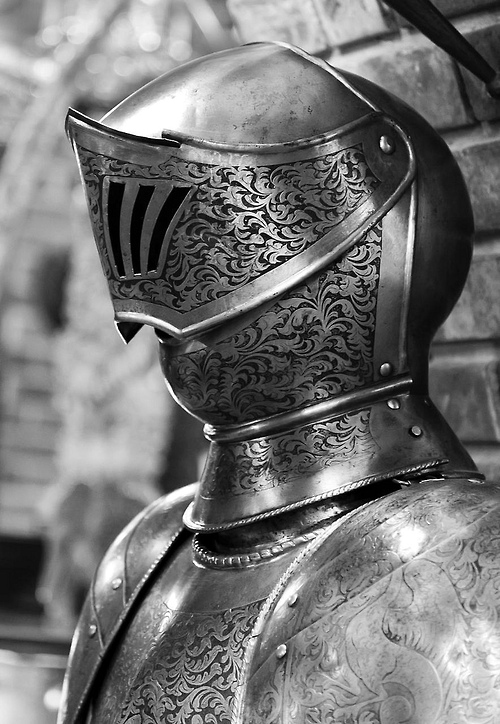 It was a feature of older types of armour and intended to protect against swords and other non-projectile weapons. Later, particularly from the 18th century onwards, the gorget became primarily ornamental, serving only as a symbolic accessory on military uniforms. 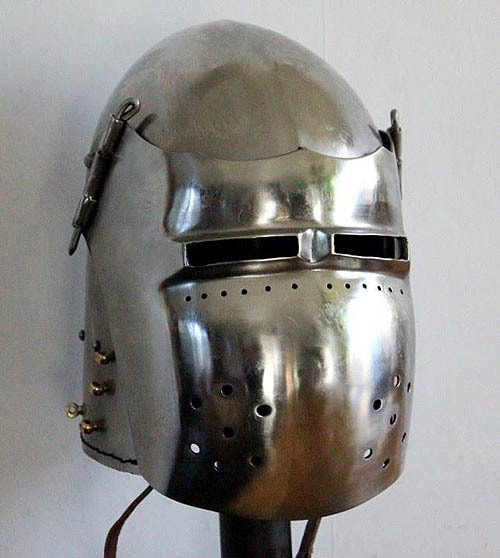 A barbute is a visorless war helmet of fifteenth century Italian design, often with distinctive "T" shaped or "Y" shaped opening for the eyes and mouth. 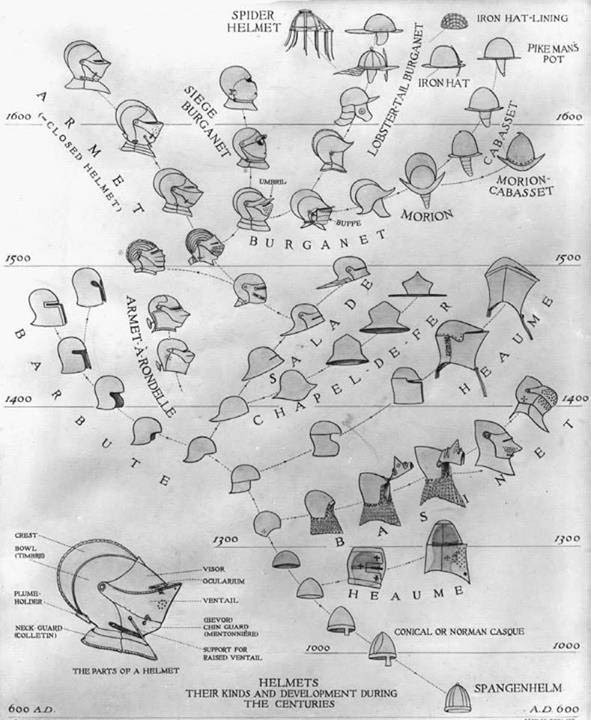 The barbute resembles classical Greek helmets and may have been influenced by a renewed interest in ancient artefacts. 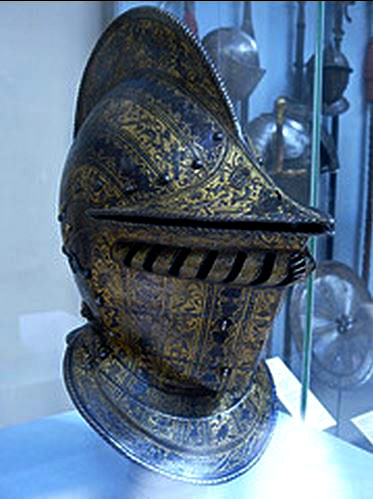 The close helm was a military helmet worn by knights and other combatants in the late medieval and early renaissance era. 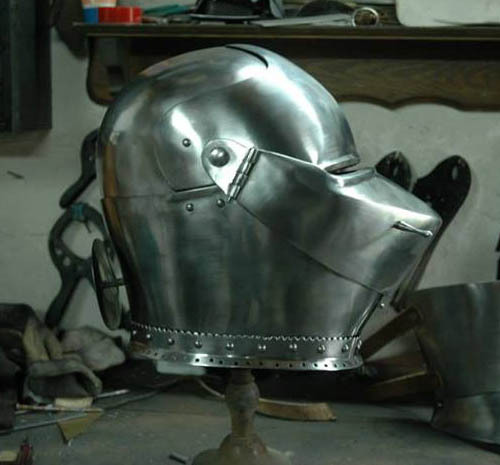 It carried a visor that pivoted up and fully enclosed the head and neck area, unlike earlier helms such as the Sallet and Barbute, which sometimes may have left the wearer more exposed, or needed a bevor to be added to protect the chin and neck. The close helm is a helm which is very similar to an armet, but has a different method of opening. While an armet has two cheekpieces, a close helm instead has a kind of bevor, which is attached in the same way to pivots as its visor. 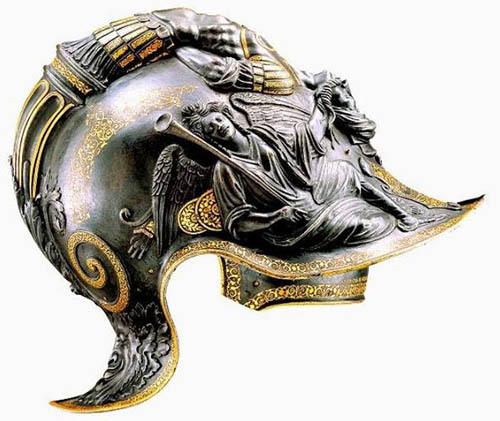 The close helmet most probably evolved from a number of different helmets, from the armet, the Italian bellows-visored sallets and possibly hinged Great Bascinets. 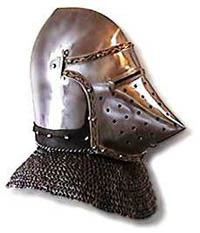 As a type of helm, they largely appeared in the later 15th century, though there are earlier examples. 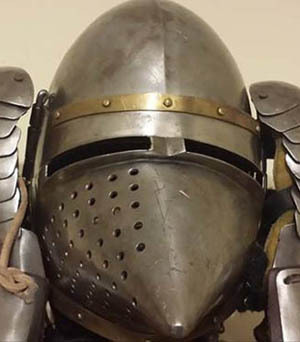 The close helm was used in battle, but was also popular in tournaments, where sometimes the visor would be less solid, and instead have bars which would still offer protection but allow more visibility. Close helms for jousting were heavier, weighing up to 12 pounds, while the helms for normal combat were lighter, often around 8 pounds. 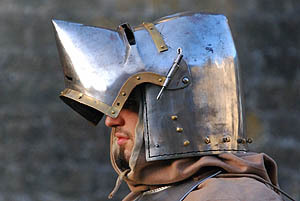 The bevor/visor of an armet is split in the middle, with the two halves hinged at the cheek, opening outwards to expose the face of the wearer. 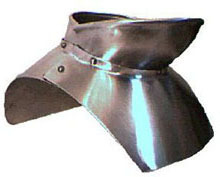 The bevor of a 'true' close helm opens by swinging upwards; it is in one piece and shares the pivot point with the visor. The close helm often had a catch to hold the visor down. 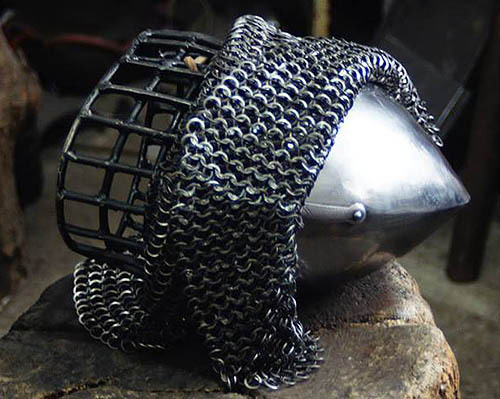 Both forms of helm may have had a round plate at the back of the helm, a protective rondel, the purpose of which is not truly known, but it is suspected that it protected strapping. Open face bowl shaped helmet with a neck collar, a peak, a very characteristic comb, sometimes with cheek pieces. Sometimes has a buffe (a visor that is raised, rather than lowered). Steel skullcap with a brim and crest, sometimes with cheek lames. 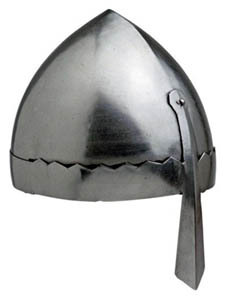 Detachable mail hung from a helmet to protect the neck and shoulders, often worn with bassinets. Worn with a sallet to cover the jaw and throat (extending somewhat down the sternum). 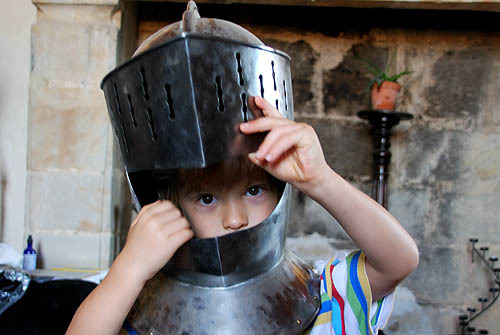 May also cover the back of the neck if worn with a bassinet rather than a sallet. May be solid or made of lamés. Sometimes worn with a gorget. 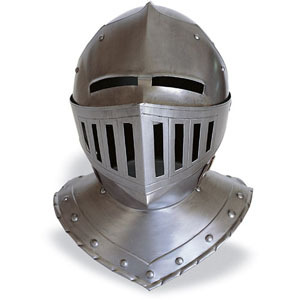 Steel collar to protect the neck and cover the neck opening in a complete cuirass. Quite unlike a modern shirt collar in that as well as covering the front and back of the neck it also covers part of the clavicles and sternum and a like area on the back. 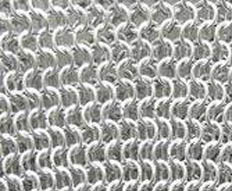 Brigandine 12th to 16th C.
A brigandine, a form of body armour, is a cloth garment, generally canvas or leather, lined with small oblong steel plates riveted to the fabric. 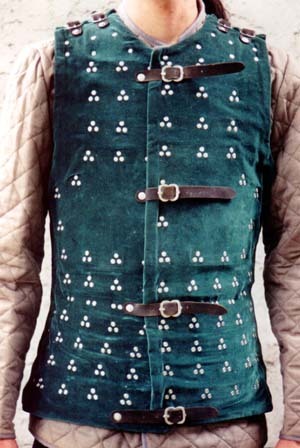 The form of the brigandine is essentially the same as the civilian doublet, though it is commonly sleeveless. 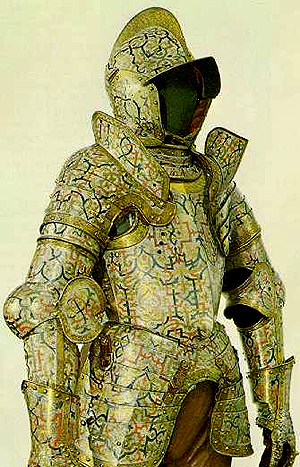 Depictions of brigandine armour with sleeves are known. 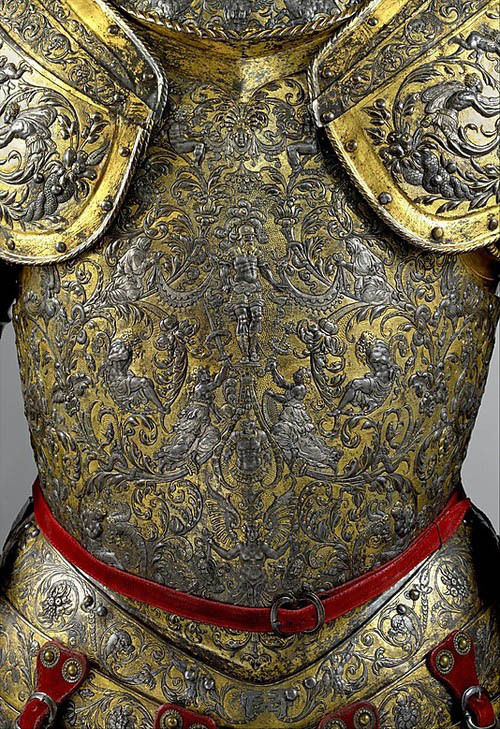 Many brigandines appear to have had larger, 'L-shaped' plates over the lungs.Rivets, or nails, attaching the plates to the fabric are often decorated, being gilt or of latten and often embossed with a design. 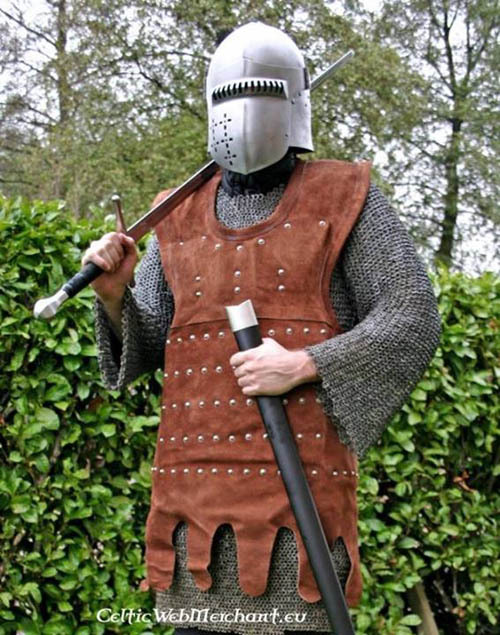 The brigandine was commonly worn over a gambeson and mail shirt and it was not long before this form of protection was commonly used by soldiers ranging in rank from archers to knights. It was most commonly used by Men-at-arms. 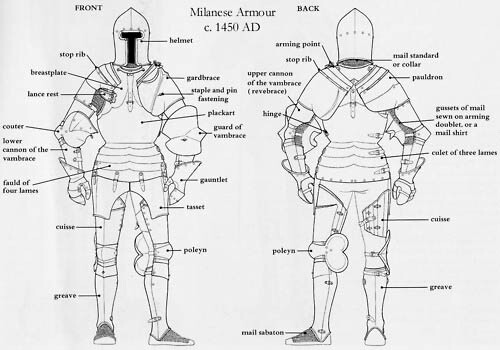 Men-at-arms wore a brigandine, along with plate arm and leg protection, as well as a helmet. Even with the gambeson and the mail shirt, a wearer was not as protected as when wearing plate, which was typically more expensive. The brigandine filled this gap well. 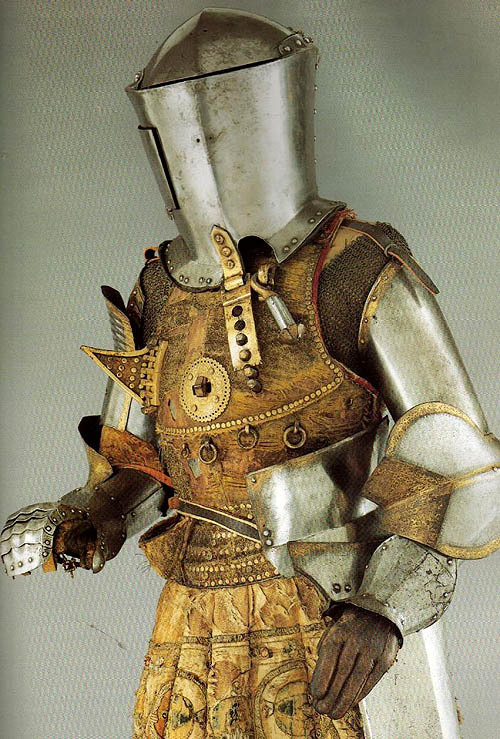 The Brigandine was simple enough in design for a soldier to make and repair his own armour without needing the high skill of an armorer. Originally the term "brigand" referred to a foot soldier. 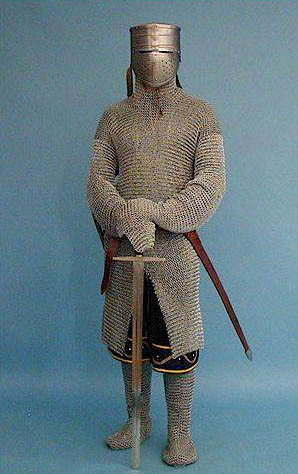 A brigandine was simply a type of armour worn by a foot soldier. It had nothing to do with its alleged ability to be concealed by bandits. In fact, brigandines were highly fashionable and were ostentatiously displayed by wealthy aristocrats both in European and in Asian courts. 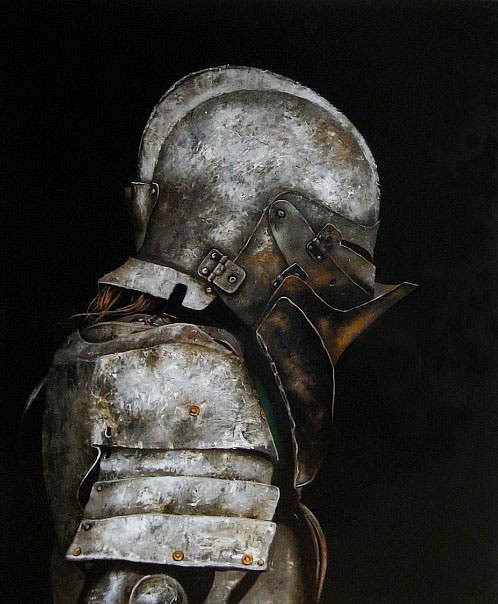 cuirass (French cuirasse) is a piece of armour formed of a single or multiple pieces of metal or other rigid material, which covers the front of the wearer's torso. In a suit of armour this piece was generally connected to a back piece and cuirass could refer to the complete torso protecting armour. The muscularity of the ideal male torso was standardised in Hellenistic and Roman times, and ossified as the heroic cuirass (in French the cuirass esthétique). 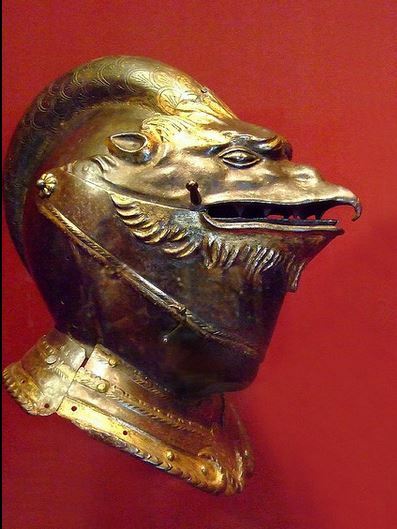 Sometimes further embellished with symbolic representation in relief.. As parts of the military equipment of classic antiquity, cuirasses and corslets of bronze, and at later periods also of iron or some other rigid substance, were habitually in use. 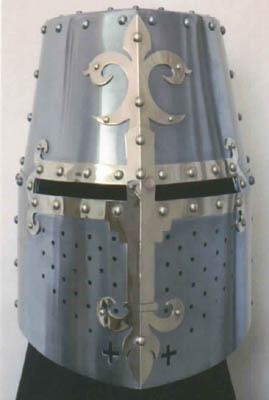 While some special kind of secondary protection for the breast had been worn in earlier times by the men-at-arms in addition to their mail hauberks and their cotes armed with splints and studs, it was not till the 14th century that a regular body-defence of plate can be said to have become an established component of medieval armour. As the fourteenth century advanced, the cuirass came into general use, in connection with plate defences for the limbs, until, at the close of the century, the long familiar inter-linked mail is no longer visible in knightly figures, except in the camail of the bascinet and at the edge of the hauberk. The almost universal usage throughout this century was that the cuirass was worn covered. 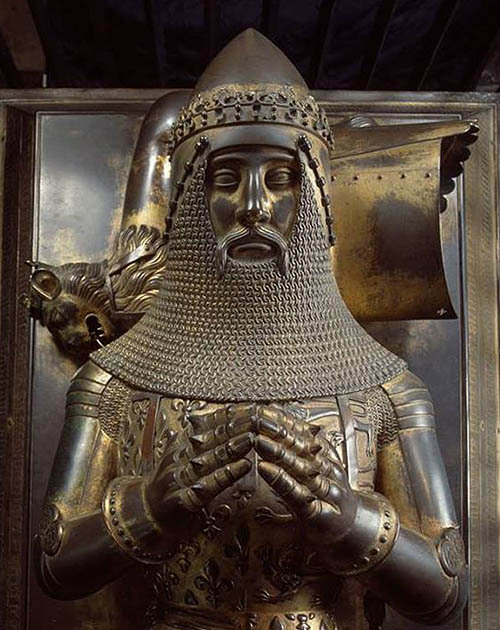 Thus, the globose form of the breast-armour of the Black Prince, in his effigy in Canterbury Cathedral, 1376, intimates that a cuirass as well as a hauberk is to be considered to have been covered by the royalty-emblazoned jupon of the prince. 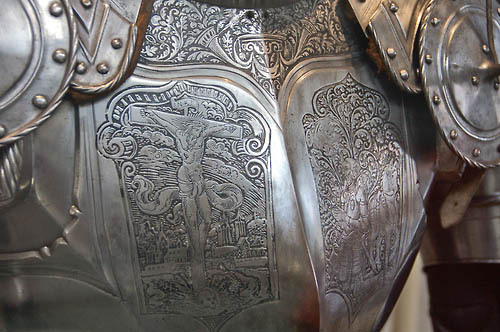 The cuirass worn in the 14th century was always made of sufficient length to rest on the hips; otherwise, if not thus supported, it must have been suspended from the shoulders, in which case it would have interfered with the action of the wearer. 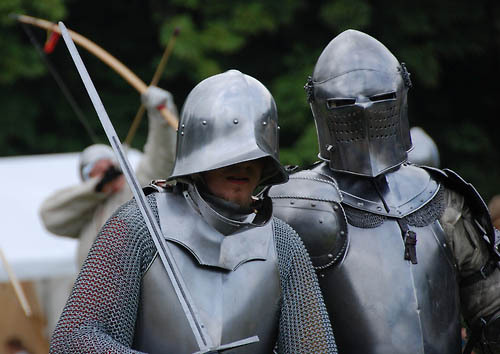 Early in the 15th century, the panoply of plate, including the cuirass, began to be worn without any surcoat; but in the concluding quarter of the century the short surcoat, with full short sleeves, known as the tabard, was in general use over the armour. 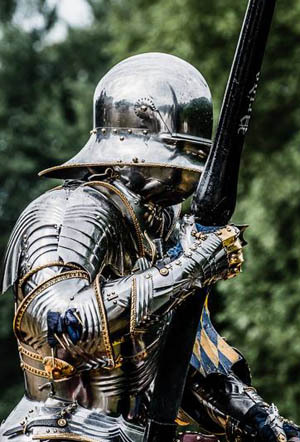 At the same time as the surcoat fell into disuse, small plates of various forms and sizes were attached to the armour in front of the shoulders, to defend the otherwise vulnerable points where the plate defences of the upper-arms and the cuirass left a gap on each side. 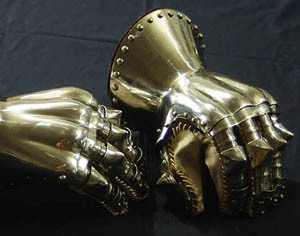 Limb armour was not always made in symmetrical pairs, the plate for the right or sword-arm often being smaller and lighter than its companion. About the middle of the century, instead of being formed of a single plate, the breastplate of the cuirass was made in two parts, the lower adjusted to overlap the upper, and contrived by means of a strap or sliding rivet to give flexibility to this defence. 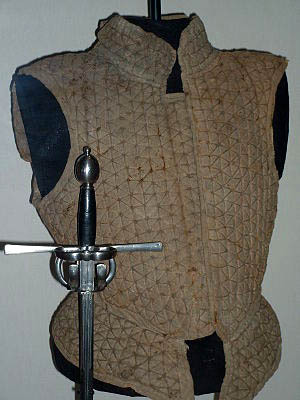 In the second half of the 15th century the cuirass occasionally was superseded by the brigandine jacket, a defence formed of textile fabric, generally of rich material, lined throughout with overlapping scales (resembling the earlier imbricated form) of metal, which were attached to the jacket by rivets, having their heads, like studs, visible on the outside. 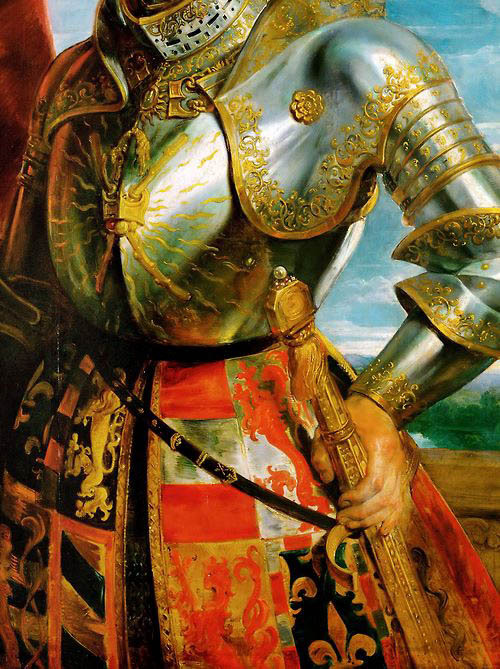 In the 16th century, when occasionally, and by personages of exalted rank, splendid surcoats were worn over the armour, the cuirassits breastpiece during the first half of the century, globular in form was constantly reinforced by strong additional plates attached to it by rivets or screws. About 1550 the breast-piece of the cuirass was characterised by a vertical central ridge, called the tapul, having near its centre a projecting point; this projection, somewhat later, was brought lower down, and eventually the profile of the plate, the projection having been carried to its base, assumed the singular form which led to this fashion of the cuirass being distinguished as the peascod cuirass. 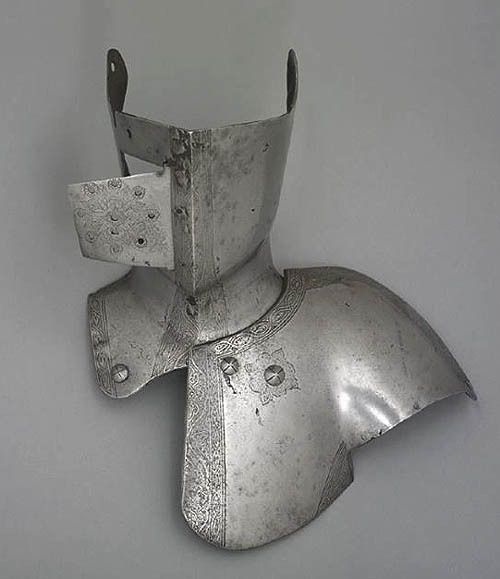 Corslets provided with both breast and back pieces were worn by foot-soldiers in the 17th century, while mounted soldiers were equipped in heavier and stronger cuirasses; and these defences continued in use after the other pieces of armour, one by one, had gradually been laid aside. 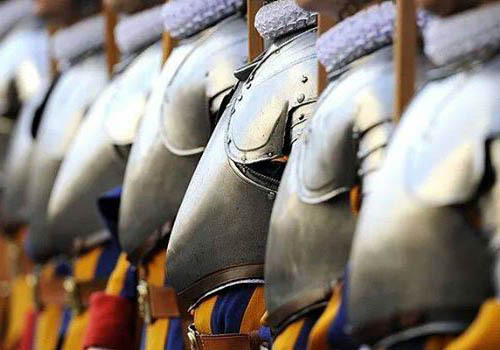 Their use, however, never altogether ceased, and in modern armies mounted cuirassiers, armed as in earlier days with breast and back plates, have in some degree emulated the martial splendour of the body armour of the era of medieval chivalry. Extra layer of armour to cover the belly. Faulds are a piece of plate armour worn below a breastplate to protect the waist and hips. They take the form of bands of metal surrounding both legs, potentially surrounding the entire hips in a form similar to a skirt. 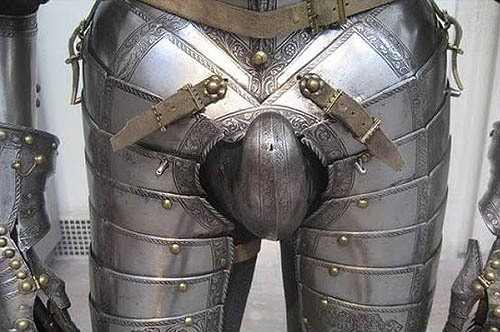 Small, horizontal lamés that protect the small of the back or the buttocks, attached to a backplate or cuirass. 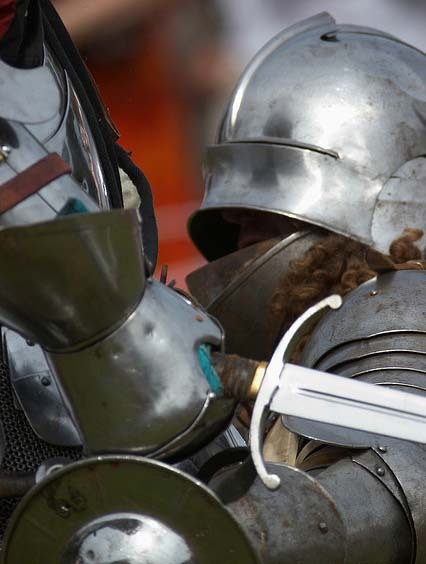 The couter is the defense for the elbow in a piece of plate armour. Initially just a curved piece of metal, as plate armour progressed the couter became an articulated joint. 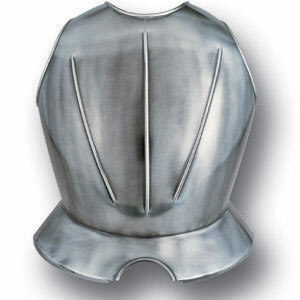 Spaulders are armoured plates worn on the upper arms and shoulders in a suit of plate armour. 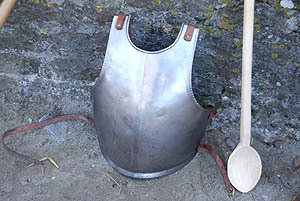 Developed during the Middle Ages, the use of spaulders declined during the Renaissance along with the use of plate armour. 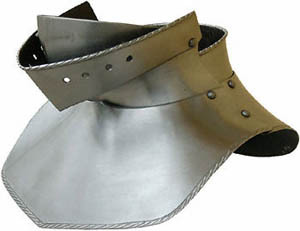 Unlike pauldrons, spaulders do not cover the arm holes when worn with a cuirass. Instead, the gaps may be covered by besagews or simply left bare, exposing the mail beneath. A pauldron (sometimes spelled pouldron or powldron) is a component of plate armour, which evolved from spaulders in the 15th century. like spaulders, pauldrons cover the shoulder area. 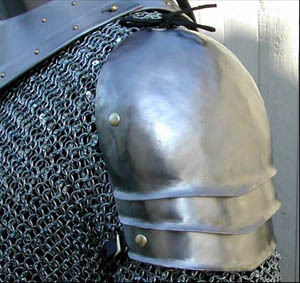 Pauldrons tend to be larger than spaulders, covering the armpit, and sometimes parts of the back and chest. 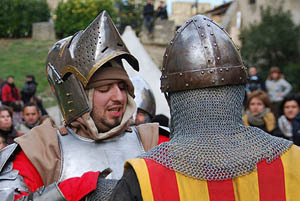 A pauldron typically consists of a single large dome-shaped piece to cover the shoulder (the "cop") with multiple lamés attached to it to defend the arm and upper shoulder. 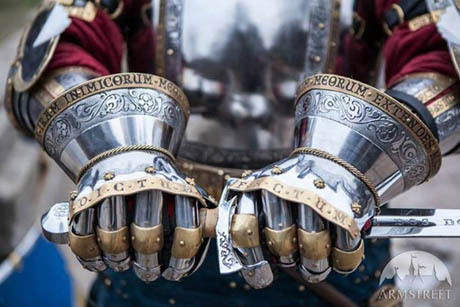 On armour designed for mounted combat, whether in the tournament or the field, the pauldrons would usually be asymmetrical, with one pauldron sporting a cut-away to make room for a lance rest. Extra plate that covers the front of the shoulder, worn over top of a pauldron. 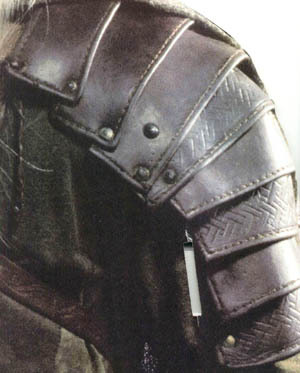 Plate that covers the section of upper arm from elbow to area covered by shoulder armour. Circular plate that covers the armpit, typically worn with spaulders. Vambrace or Lower Cannon (of Vambrace) 14th C.
Forearm guard. May be solid metal or splints of metal attached to a leather backing. Developed in antiquity but named in the 14th C. Vambrace may also sometimes refer to parts of armour that together cover the lower and upper arms. 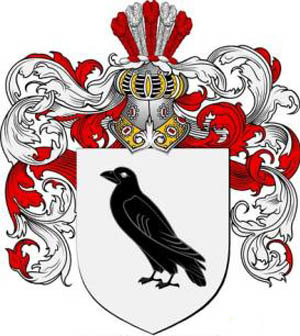 An additional layer of armour that goes over cowter, in which case it is proper to speak of the lower cannon of the vambrace which is the forearm guard, and the upper cannon of vambrace which is the rerebrace. 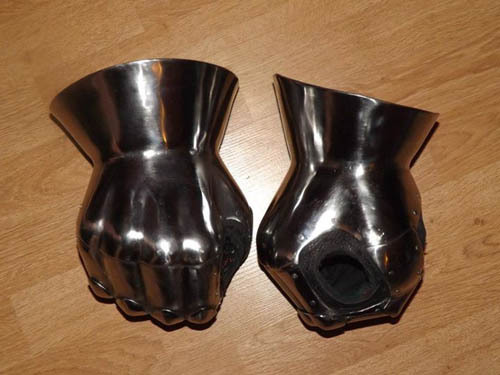 Gauntlets are armoured gloves that cover from the fingers to the forearms, made from many materials. 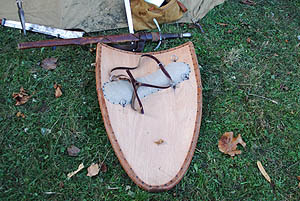 Plate that covers the knee, appeared early in the transition from mail to plate, later articulated to connect with the cuisses and schynbald or greave. Often with fins or rondel to cover gaps. Used in antiquity, lost but later reintroduced in 13th C. used till 15th C. Plate that covered only the shins, not the whole lower leg.. Covers the lower leg, front and back, made from a variety of materials, but later most often plate. Plate that cover the thighs, made of various materials depending upon period. Covers the foot, often mail or plate. Bands hanging from faulds or breastplate to protect the upper legs. 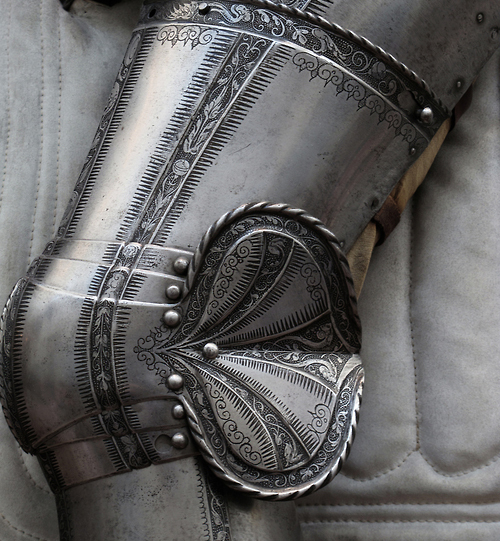 Right Thigh and Knee Defense (Cuisse and Poleyn) for the Armour of Sir John Scudamore (1541 or 15421623). Band of steel plate, put together severally so that several bands can articulate on various areas like around the thighs, shoulders or waist. Such pieces are named for the number of bands, for instance, a fauld of four lamé. Padded cloth worn under a harness. Any circular plate. Roundels protecting various areas may have particular names, such as a besagew protecting the shoulder joint. 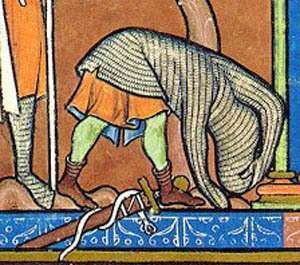 Horses in the Middle Ages were rarely differentiated by breed, but rather by use. This led them to be described, for example, as "chargers" (war horses), "palfreys" (riding horses), cart horses or packhorses. Reference is also given to their place of origin, such as "Spanish horses," but whether this referred to one breed or several is unknown. The Spanish also retained many quality horses, in part due to the historic reputation of the region as a horse-breeding land, and partially due to the cultural influences related to the Islamic conquest of the Iberian peninsula between the 8th and 15th centuries. The origins of the medieval war horse are obscure, although it is believed they had some Barb and Arabian blood, through the Spanish Jennet, a forerunner to the modern Friesian and Andalusian horse. It is also possible that other sources of oriental bloodstock came from what was called the Nisaean breed (possibly akin to the Turkoman horse) from Iran and Anatolia, another type of oriental horse brought back from the Crusades. "Spanish" horses, whatever their breeding, were the most expensive. It is also hard to trace what happened to the bloodlines of destriers when this type seems to disappear from record during the seventeenth century. Many modern draft breeds claim some link to the medieval "great horse," with some historians considering breeds such as the Percheron, Belgian and Suffolk Punch likely descendants of the destrier. Other historians discount this theory, since the historical record suggests the medieval warhorse was quite a different 'type' to the modern draught horse Such a theory would suggest the war horses were crossed once again with "cold blooded" work horses, since war horses, and the destrier in particular, were renowned for their hot-blooded nature. One of the best-known of the medieval horses was the destrier, renowned and admired for its capabilities in war. It was well trained, and was required to be strong, fast and agile. A fourteenth century writer described them as "tall and majestic and with great strength". In contemporary sources, the destrier was frequently referred to as the "great horse" because of its size and reputation. Being a subjective term, it gives no firm information about its actual height or weight, but since the average horse of the time was 12 to 14 hands (48 to 56 inches (120 to 140 cm)), thus a "great horse" by medieval standards might appear small to our modern eyes. The destrier was highly prized by knights and men-at-arms, but was actually not very common, and appears to have been most suited to the joust. A more general-purpose horse was the rouncey (also rounsey), which could be kept as a riding horse or trained for war. 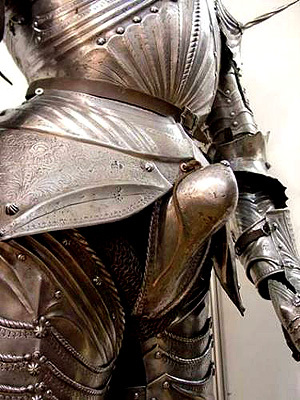 It was commonly used by squires, men-at-arms or poorer knights. A wealthy knight would keep rounceys for his retinue. Sometimes the expected nature of warfare dictated the choice of horse; when a summons to war was sent out in England, in 1327, it expressly requested rounceys, for swift pursuit, rather than destriers. Rounceys were sometimes used as pack horses. The well-bred palfrey, which could equal a destrier in price, was popular with nobles and highly-ranked knights for riding, hunting and ceremonial use. Ambling was a desirable trait in a palfrey, as the smooth gait allowed the rider to cover long distances quickly in relative comfort. Other horse types included the jennet, a small horse first bred in Spain from Barb and Arabian bloodstock Their quiet and dependable nature, as well as size, made them popular as riding horses for ladies; however, they were also used as cavalry horses by the Spanish. The hobby was a lightweight horse, about 13 to 14 hands (52 to 56 inches (130 to 140 cm)), developed in Ireland from Spanish or Libyan (Barb) bloodstock. This type of quick and agile horse was popular for skirmishing, and was often ridden by light cavalry known as Hobelars. 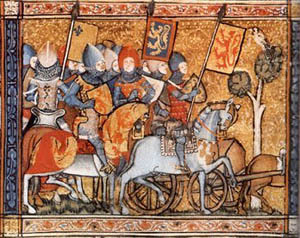 Hobbies were used successfully by both sides during the Wars of Scottish Independence, with Edward I of England trying to gain advantage by preventing Irish exports of the horses to Scotland. Robert Bruce employed the hobby for his guerilla warfare and mounted raids, covering 60 to 70 miles (97 to 110 km) a day. 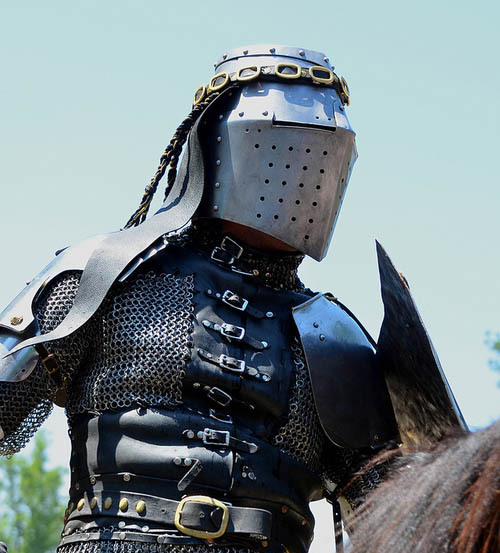 While light cavalry had been used in warfare for many centuries, the medieval era saw the rise of heavy cavalry, particularly the European knight. 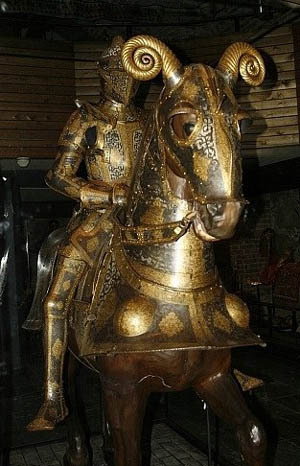 Historians are uncertain when the use of heavy cavalry in the form of mounted shock troops first occurred, but the technique had become widespread by the mid 12th Century. The heavy cavalry charge itself was not a common occurrence in warfare. Pitched battles were avoided, if at all possible, with most offensive warfare in the early Middle Ages taking the form of sieges, or swift mounted raids called chevauchées, with the warriors lightly armed on swift horses and their heavy war horses safely in the stable. Pitched battles were sometimes unavoidable, but were rarely fought on land suitable for heavy cavalry. While mounted riders remained effective for initial attacks, by the fourteenth century, it was common for knights to dismount to fight. Horses were sent to the rear, and kept ready for pursuit. By the Late Middle Ages (approx 1300-1550), large battles became more common, probably because of the success of infantry tactics and changes in weaponry. Because such tactics left the knight unmounted, the role of the war horse also changed. By the 17th century, the medieval charger had become a thing of the past, replaced by lighter, unarmoured horses. Throughout the period, light horse, or prickers, were used for scouting and reconnaissance; they also provided a defensive screen for marching armies. Large teams of draught horses, or oxen, were used for pulling the heavy early cannon. Other horses pulled wagons and carried supplies for the armies. 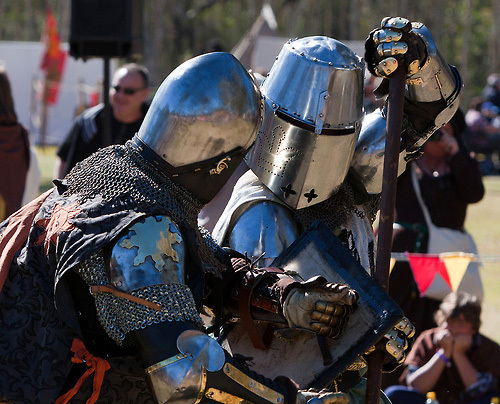 Tournaments and hastiludes began in the eleventh century as both a sport and to provide training for battle. 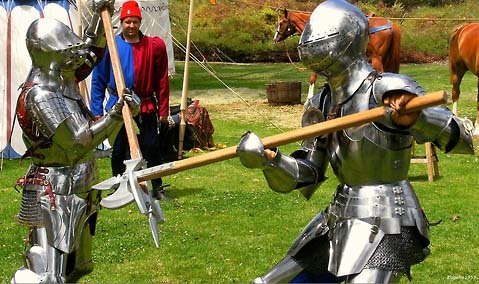 Usually taking the form of a melee, the participants used the horses, armour and weapons of war. The sport of jousting grew out of the tournament and, by the fifteenth century, the art of tilting became quite sophisticated. In the process, the pageantry and specialisation became less warlike, perhaps because of the knight's changing role in war. Horses were specially bred for the joust, and heavier armour developed. This did not necessarily lead to significantly larger horses. Interpreters at the Royal Armouries, Leeds, have re-created the joust, using specially bred horses and replica armour. Their horses are 15-16 hands high (60 to 64 inches (150 to 160 cm)), and approximately 1,100 pounds (500 kg), and perform well in the joust. The most well known horse of the medieval era of Europe is the destrier, known for carrying knights into war. However, most knights and mounted men-at-arms rode smaller horses known as coursers and rounceys. (A generic name often used to describe medieval war horses is charger, which appears interchangeable with the other terms). In Spain, the jennet was used as a light cavalry horse. Stallions were often used as war horses in Europe due to their natural aggression and hot-blooded tendencies. A thirteenth century work describes destriers "biting and kicking" on the battlefield, and, in the heat of battle, war horses were often seen fighting each other. However, the use of mares by European warriors cannot be discounted from literary references. Mares were the preferred war horse of the Moors, the Islamic invaders who attacked various European nations from A.D. 700 through the 15th Century. There is dispute in medievalist circles over the size of the war horse, with some notable historians claiming a size of 17 to 18 hands (68 to 72 inches (170 to 180 cm)), as large as a modern Shire horse. However, there are practical reasons for dispute over size. Analysis of existing horse armour located in the Royal Armouries indicates the equipment was originally worn by horses of 15 to 16 hands (60 to 64 inches (150 to 160 cm)), or about the size and build of a modern field hunter or ordinary riding horse. Research undertaken at the Museum of London, using literary, pictorial and archaeological sources, supports military horses of 14-15 hands (56 to 60 inches (140 to 150 cm)), distinguished from a riding horse by its strength and skill, rather than its size. This average does not seem to vary greatly across the medieval period. Horses appear to have been selectively bred for increased size from the ninth and tenth centuries, and by the eleventh century the average warhorse was probably 14.2 to 15 hh (58 to 60 inches (150 to 150 cm)), a size verified by studies of Norman horseshoes as well as the depictions of horses on the Bayeux Tapestry. 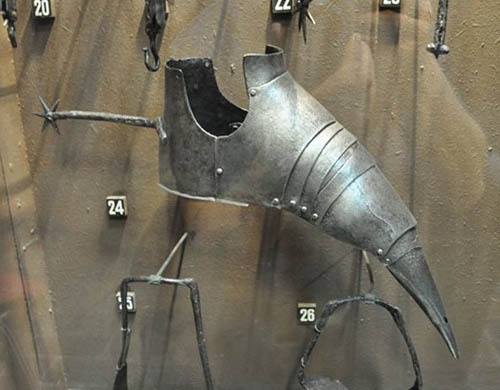 Analysis of horse transports suggests thirteenth century destriers were a stocky build, and no more than 15-15.2 hands (60 to 62 inches (150 to 160 cm)).Three centuries later, war-horses were not significantly bigger; the Royal Armouries used a 15.2 hand (62 inches (160 cm)) Lithuanian Heavy Draught mare as a model for the statues displaying various fifteenth-sixteenth century horse armours, as her body shape was an excellent fit. 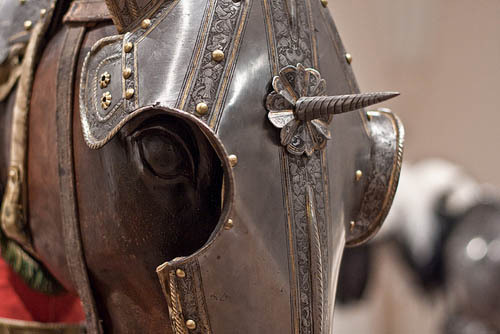 Perhaps one reason for the pervasive belief that the medieval war horse had to be of draught horse type is the assumption, still held by many, that medieval armour was heavy. 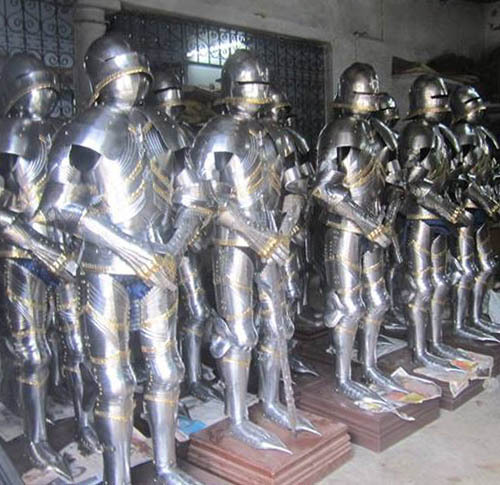 In fact, even the heaviest tournament armour (for knights) weighed little more than 90 pounds (41 kg), and field (war) armour 40 to 70 pounds (18 to 32 kg); barding, or horse armour, more common in tournaments than war, rarely weighed more than 70 pounds (32 kg). For horses, Cuir bouilli (a type of hardened leather), and padded caparisons would have been more common, and probably as effective. Allowing for the weight of the rider and other equipment, horses can carry approximately 30% of their weight; thus such loads could certainly be carried by a heavy riding horse in the 1,200 to 1,300 pounds (540 to 590 kg) range, and a draught horse was not needed. 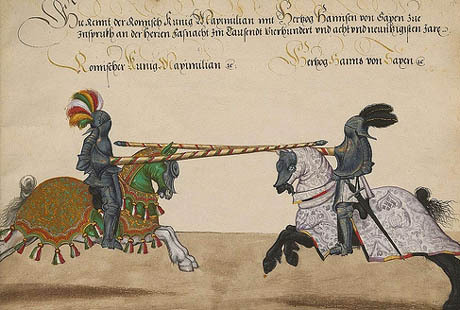 Although a large horse is not required to carry an armoured knight, it is held by some historians that a large horse was desirable to increase the power of a lance strike. Practical experiments by re-enactors have suggested that the rider's weight and strength is of more relevance than the size of the mount, and that little of the horse's weight is translated to the lance. Further evidence for a 14-16 hand (56 to 64 inches (140 to 160 cm)) war horse is that it was a matter of pride to a knight to be able to vault onto his horse in full armour, without touching the stirrup. This arose not from vanity, but necessity: if unhorsed during battle, a knight would remain vulnerable if unable to mount by himself. In reality a wounded or weary knight might find it difficult, and rely on a vigilant squire to assist him. 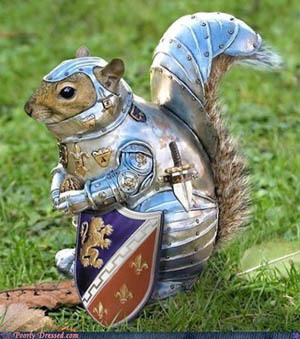 Incidentally, a knight's armour served in his favour in any fall. With his long hair twisted on his head to form a springy padding under his padded-linen hood, and his helm placed on top, he had head protection not dissimilar to a modern bicycle or equestrian helmet. Because of the necessity to ride long distances over uncertain roads, smooth-gaited horses were preferred, and most ordinary riding horses were of greater value if they could do one of the smooth but ground-covering four-beat gaits collectively known as an amble rather than the more jarring trot. The saddle with a solid tree provided a bearing surface to protect the horse from the weight of the rider. The Romans are credited with the invention of the solid-treed saddle, possibly as early as the first century BC, and it was widespread by the 2nd century AD Early medieval saddles resembled the Roman "four-horn" saddle, and were used without stirrups. The development of the solid saddle tree was significant; it raised the rider above the horse's back, and distributed the rider's weight, reducing the pounds per square inch carried on any one part of the horse's back, thus greatly increasing the comfort of the horse and prolonging its useful life. Horses could carry more weight when distributed across a solid saddle tree. It also allowed a more built up seat to give the rider greater security in the saddle. From the twelfth century, on the high war-saddle became more common, providing protection as well as added security. The built up cantle of a solid-treed saddle enabled horsemen to use lance more effectively. Beneath the saddle, caparisons or saddle cloths were sometimes worn; these could be decorated or embroidered with heraldic colours and arms. 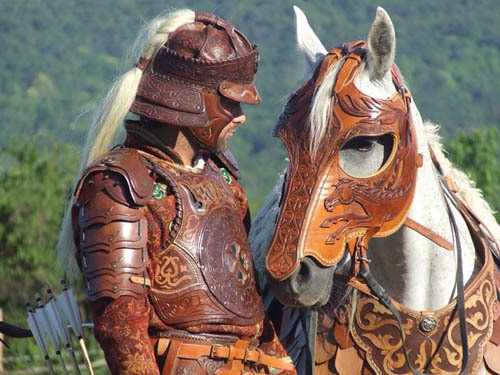 War horses could be equipped with additional covers, blankets and armour collectively referred to as barding; this could be for decorative or protective purposes. 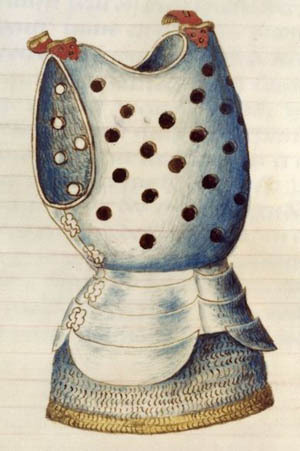 Early forms of horse armour, usually restricted to tournaments, comprised padded leather pieces, covered by a trapper (a decorated cloth), which was not particularly heavy. 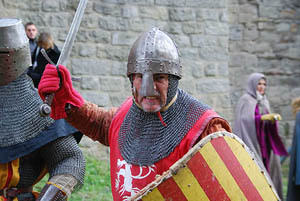 Mail and plate armour was also occasionally used; there are literary references to horse armour (an "iron blanket") starting in the late twelfth century. The increased use of the stirrup from the eighth century on aided the warrior's stability and security in the saddle when fighting. There was a variety of headgear used to control horses, predominantly bridles with assorted designs of bits. Many of the bits used during the Middle Ages resemble the bradoon, snaffle bit and curb bit that are still in common use today. However, they often were decorated to a greater degree: the bit rings or shanks were frequently covered with large, ornamental "bosses" Some designs were also more extreme and severe than those used today. The curb bit was known during the classical period, but was not generally used during the Middle Ages until the mid-14th century. Some styles of snaffle bit used during the Middle Ages had the lower cheek extended, in the manner of the modern half-cheek or full cheek snaffle. Until the late 13th century, bridles generally had a single pair of reins; after this period it became more common for knights to use two sets of reins, similar to that of the modern double bridle, and often at least one set was decorated. A large number of trades and positions arose to ensure the appropriate management and care of horses. In great households, the marshal was responsible for all aspects relating to horses: the care and management of all horses from the chargers to the pack horses, as well as all travel logistics. The position of marshal (literally "horse servant") was a high one in court circles and the king's marshal (such as the Earl Marshal in England) was also responsible for managing many military matters. Also present within the great households was the constable (or "count of the stable"), who was responsible for protection and the maintenance of order within the household and commanding the military component and, with marshals, might organise hastiludes and other chivalrous events. Within lower social groupings, the 'marshal' acted as a farrier. 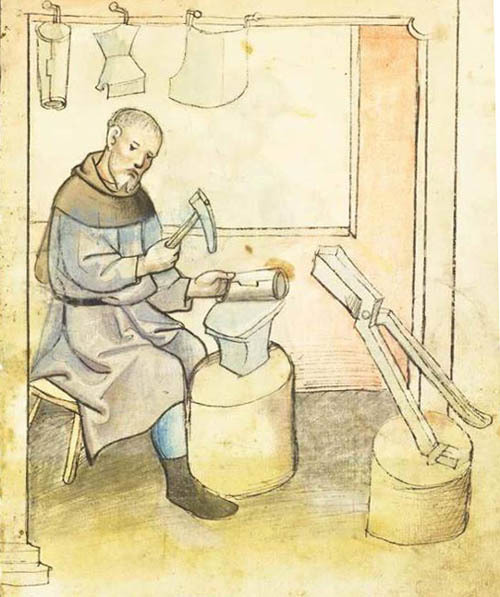 The highly-skilled marshal made and fitted horseshoes, cared for the hoof, and provided general veterinary care for horses; throughout the Middle Ages, a distinction was drawn between the marshal and the blacksmith, whose work was more limited. Most medieval women rode astride. While an early chair-like side-saddle with handles and a footrest was available by the 13th century and allowed women of the nobility to ride while wearing elaborate gowns, they were not universally adopted during the Middle Ages. This was largely due to the insecure seat they offered, which necessitated a smooth-gaited horse being led by another handler. The side-saddle did not become practical for everyday riding until the 16th century development of the pommel horn that allowed a woman to hook her leg around the saddle and hence use the reins to control her own horse. Even then, side-saddle riding remained a precarious activity until the invention of the second, "leaping horn" in the 19th century. It was not unknown for women to ride war horses, and take their part in warfare. Joan of Arc is probably the most famous female warrior of the medieval period, but there were others, including the Empress Matilda who, armoured and mounted, led an army against her cousin Stephen of Blois, and Stephen's wife Matilda of Boulogne in the 12th Century. 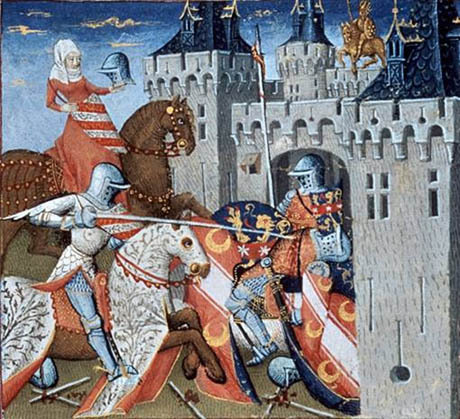 The fifteenth-century writer Christine de Pizan advised aristocratic ladies that they must "know the laws of arms and all things pertaining to warfare, ever prepared to command her men if there is need of it." Metropolitan Museum of Art in New York City, New York. 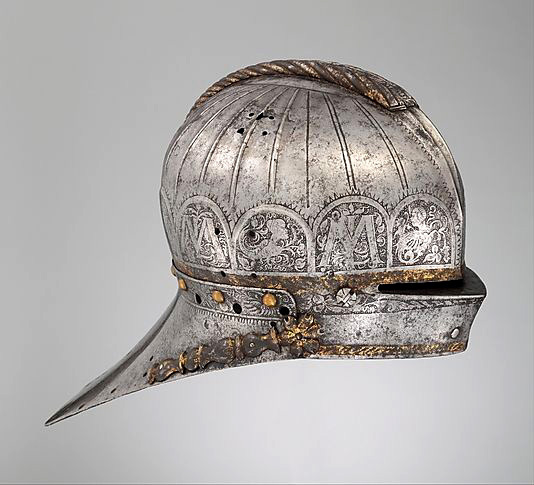 Steel armet with wrapper (held on by a strap) c. 1475; Italian, probably made in Milan. Grandguard Possibly Jörg Sorg II (c. 1522) , Etcher Augsburg, Germany c. 1550 Steel and gold, etched and gilded Weight 3.969 kg Wallace Collection.